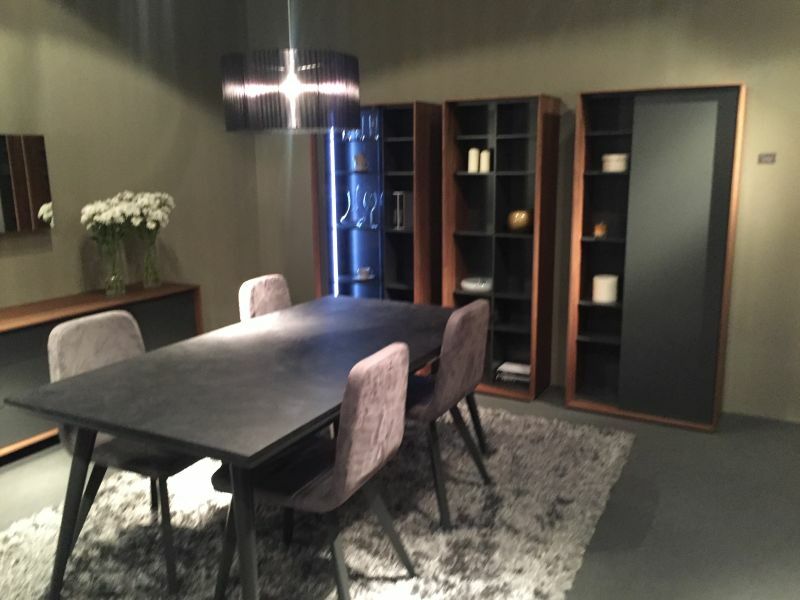 If you would have to design a new dining room right now, what kind of table would you choose for it? The question is not as simple as it may seem. 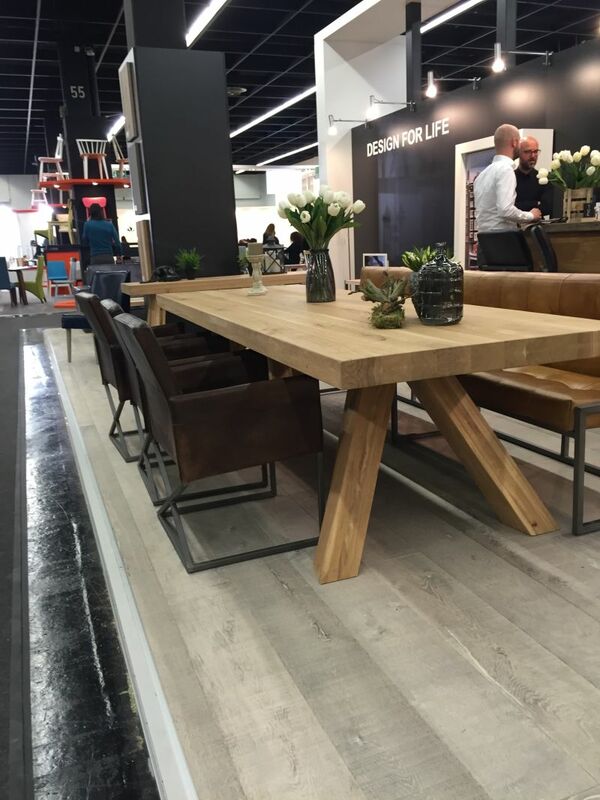 The world of dining table is not reduced to just the usual types with rectangular tops and wooden legs. 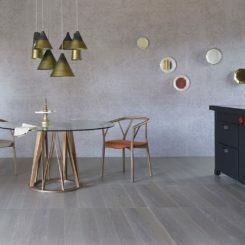 Dining room tables come in a wide variety of designs, styles, sizes, colors and finishes and they each have a set of unique characteristics that makes them special. If you’re still set on the standard look, perhaps one of the following designs can change your mind. This is the most common type of dining table. 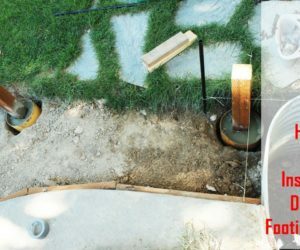 The rectangular top is very versatile and highly practical in most homes and environments. 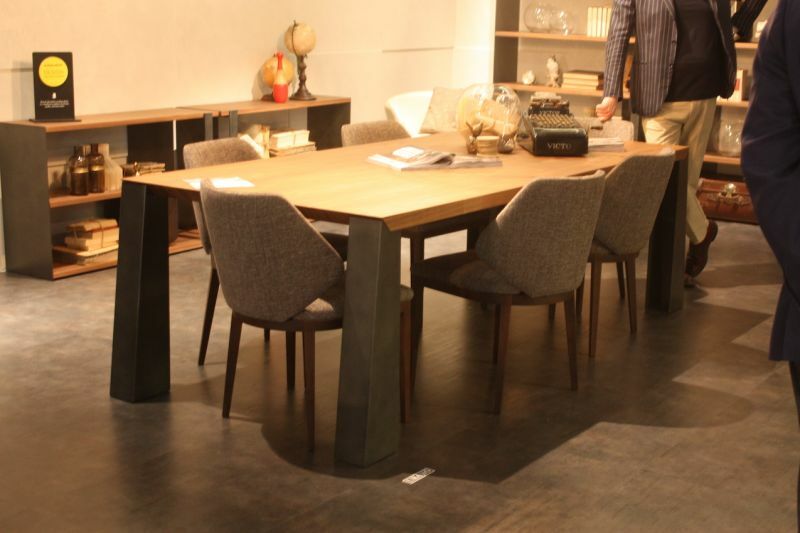 Rectangular dining tables are particularly practical in rooms that are long and narrow. They suit this sort of layout without making the room seem even smaller. 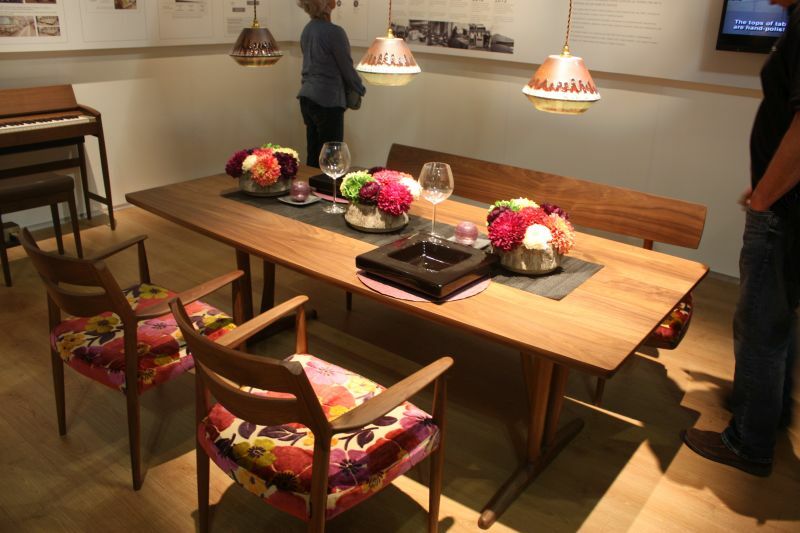 There are many different ways in which to decorate around a rectangular dining table. For example, add a rectangular area rug under it to highlight the geometry. 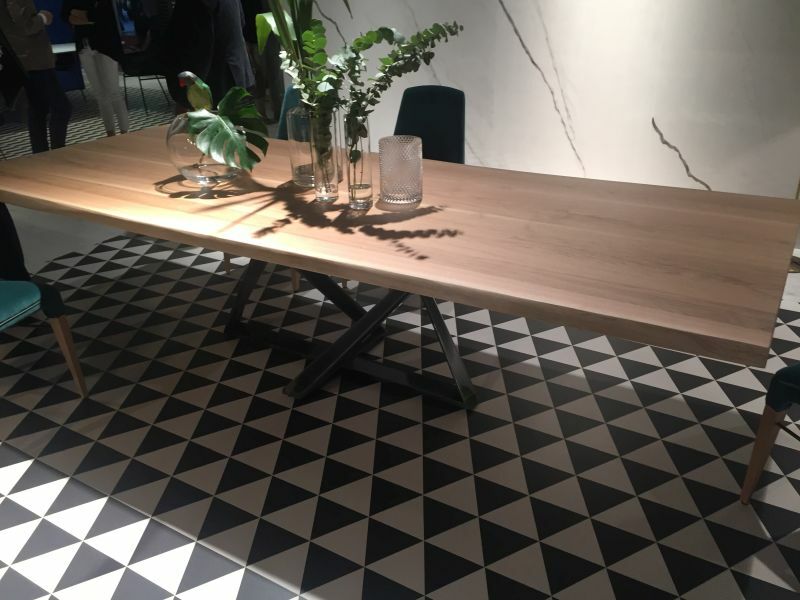 The clean lines and straight angles of a table with a rectangular top can seem a bit harsh in some cases. 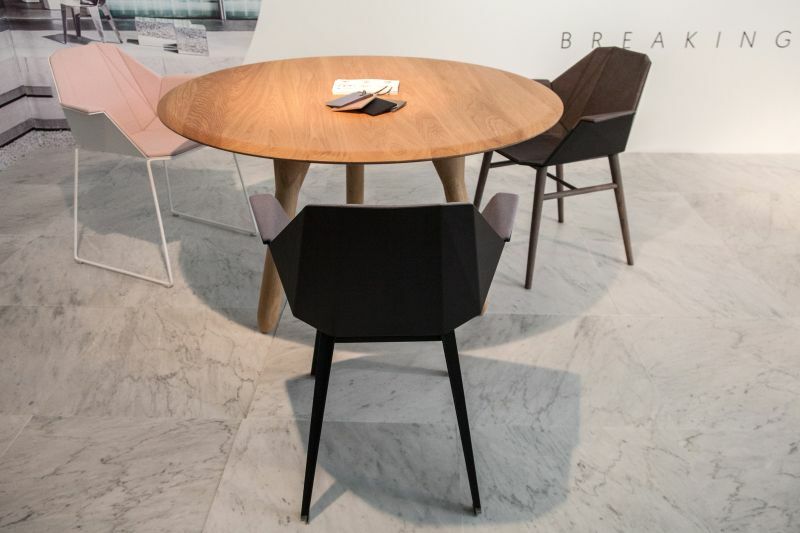 You can soften the look with a collection of chairs that have delicate curves and smooth lines. 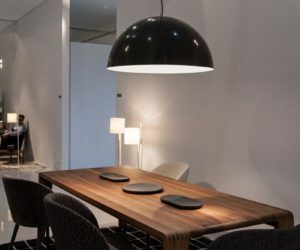 Similarly, decorate the dining space with spherical or rounded lighting fixtures. This trio of pendant lamps also looks interesting thanks to their bright color. The balance is really nice here between the table and the chairs. 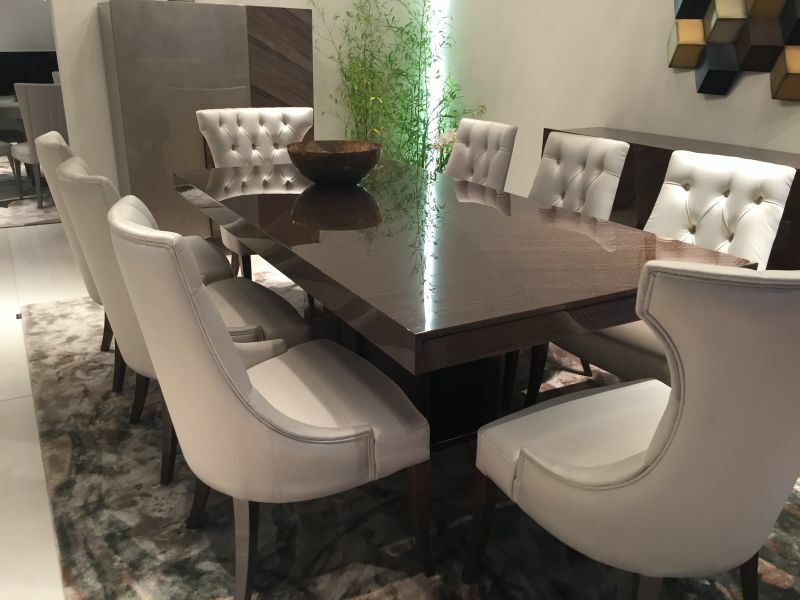 The table has a rectangular top while the chairs have curved back and armrests. Also, there’s a nice contrast of light and dark tones. 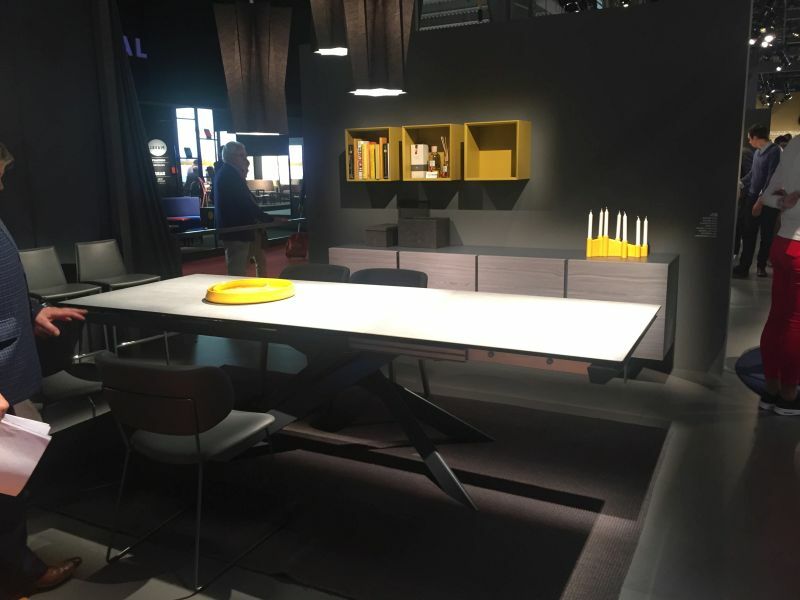 The length of a dining table can differ quite a bit from model to model. This one, for example, looks really sleek and thanks to its long and narrow top. 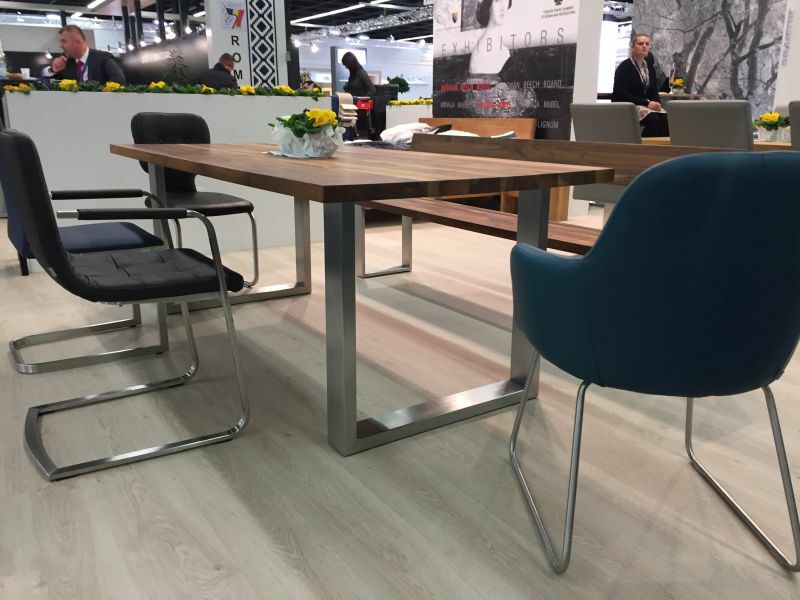 In this case, there’s a nice dialogue between the top of the table and the chair frames as well as between the table base and the chair seats. 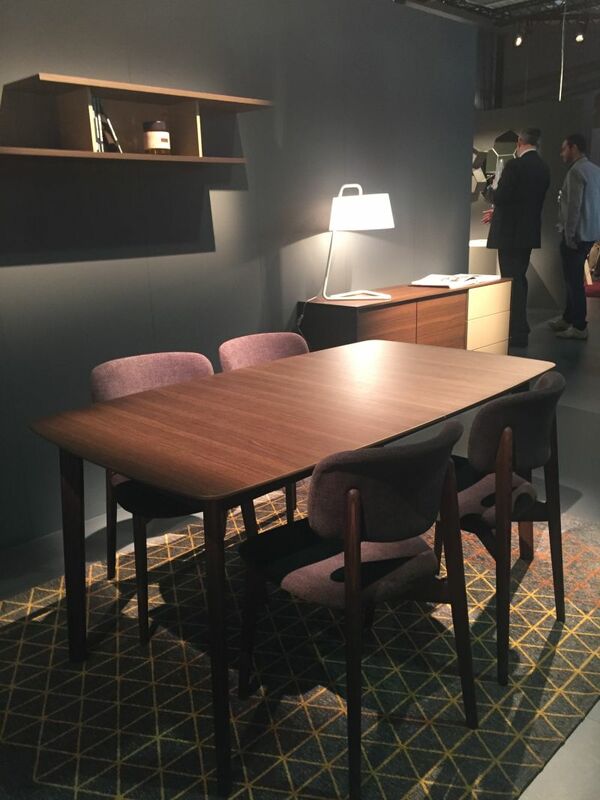 Then there’s also the contrast between the two types of dining chairs. 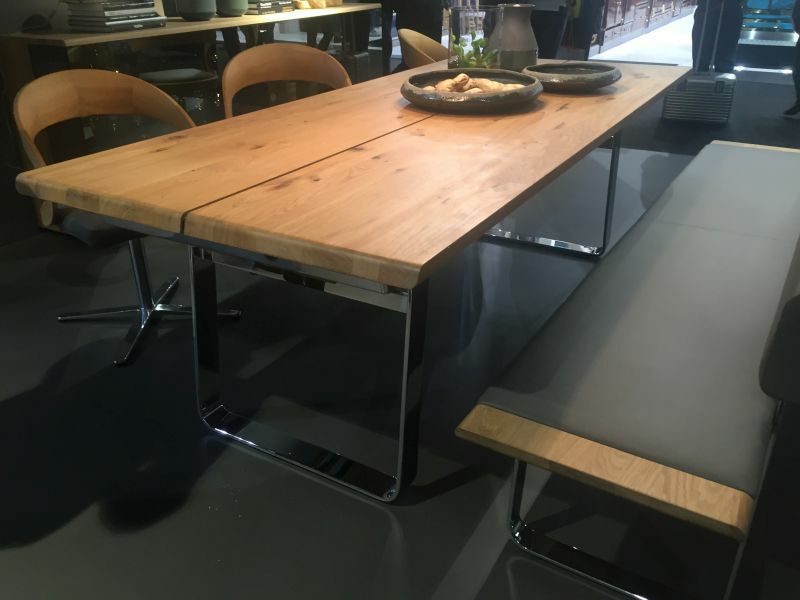 A rectangular top dining table is a good option for a traditional home or if you want to create a more formal atmosphere. 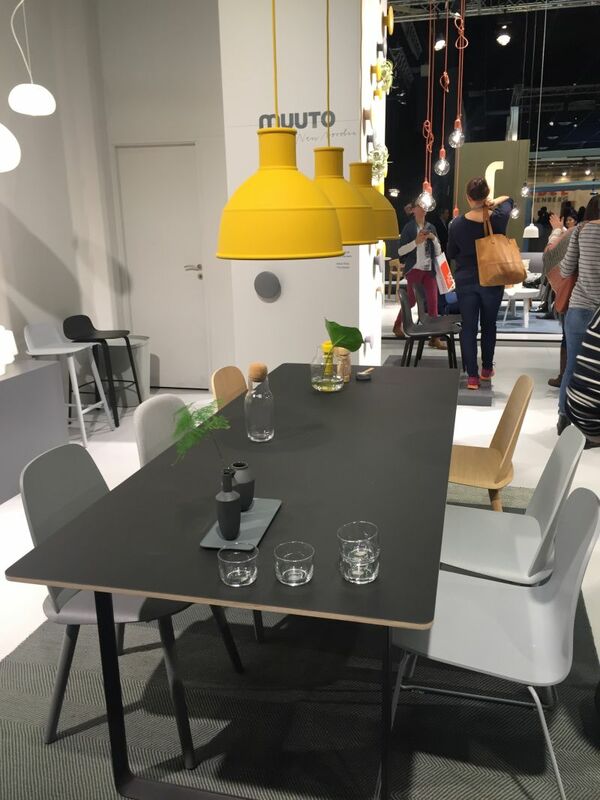 You could choose to match the table to some of the other furniture pieces or decorations. 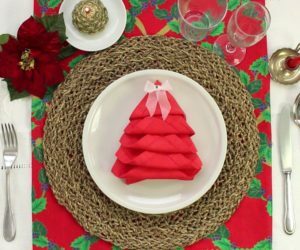 Use table runners to either emphasize the length of the dining table or to make it look smaller and more cozy and comfortable by placing them horizontally along the width of the table. 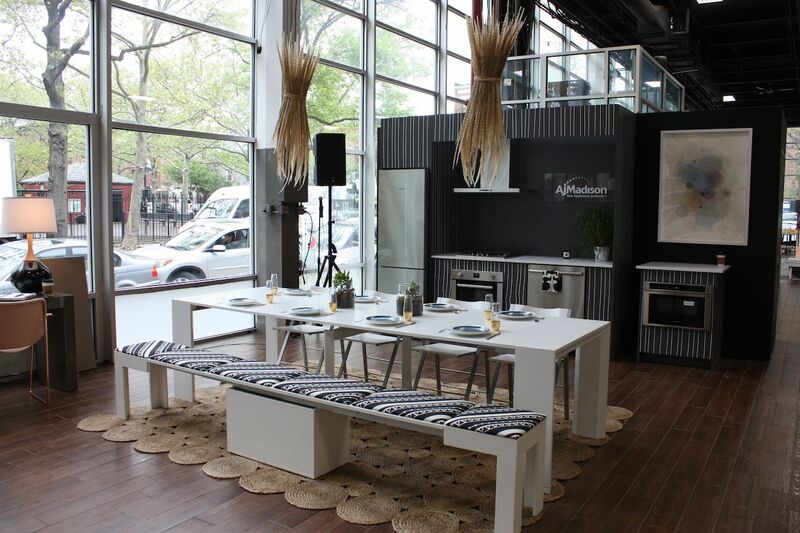 Complement a rectangular dining table with benches. 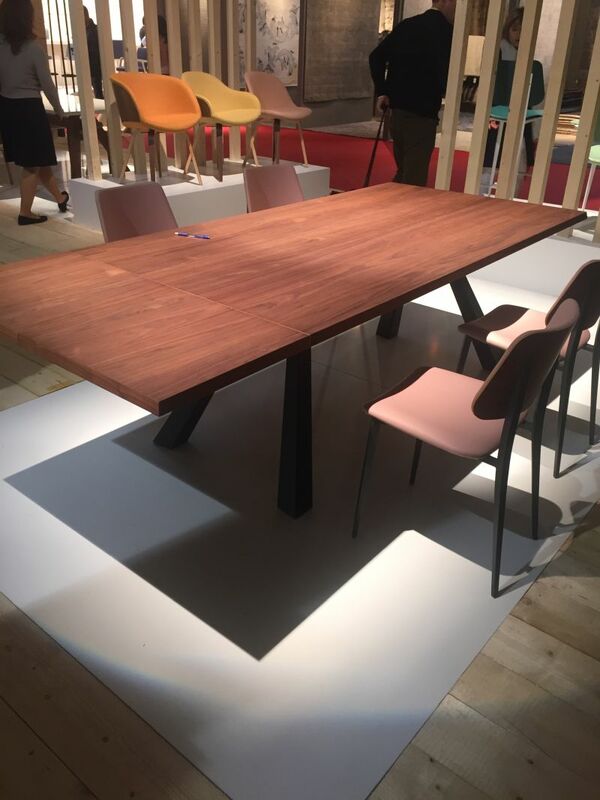 Or perhaps you’d prefer to have a bench on one side of the table while the other side features individual chairs. 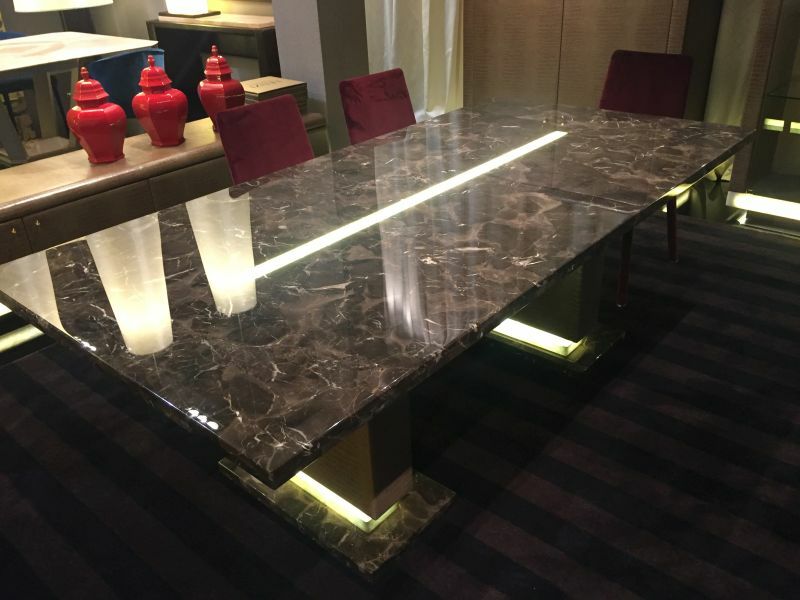 The harsh and sober look of a rectangular top table can be softened by rounded corners. 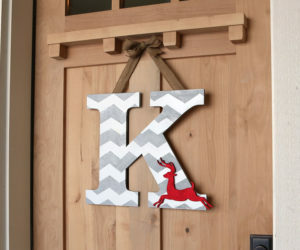 This little details can greatly change the overall look of this basic piece of furniture. 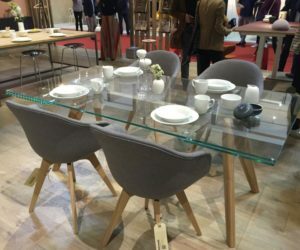 Pick the dining table based on the style of your home and the overall design and decor of the room you want to place it in. Need something traditional? How about something like this? 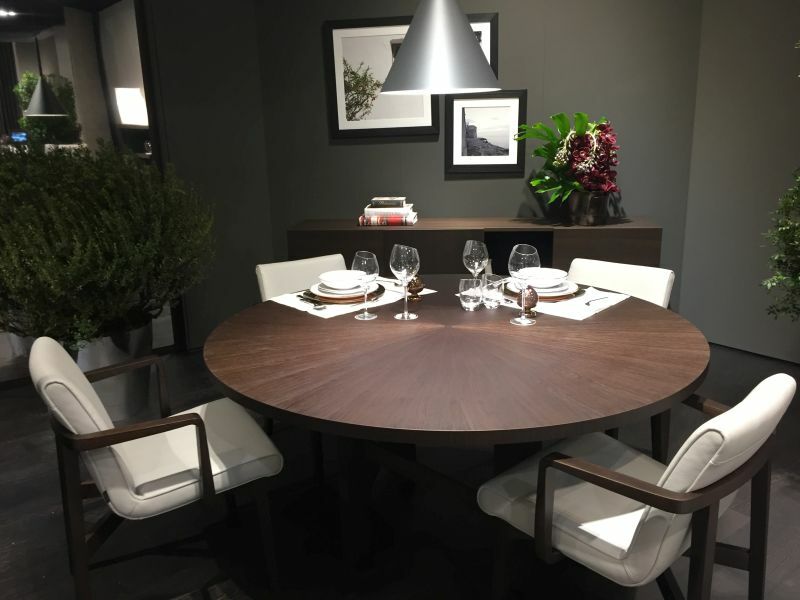 You can also make a dining table seem less formal despite its shape and design by complementing it with comfortable seating. For example, an upholstered bench or a small sofa could be an interesting choice. In some cases the design can deviate a little bit from its core concept. 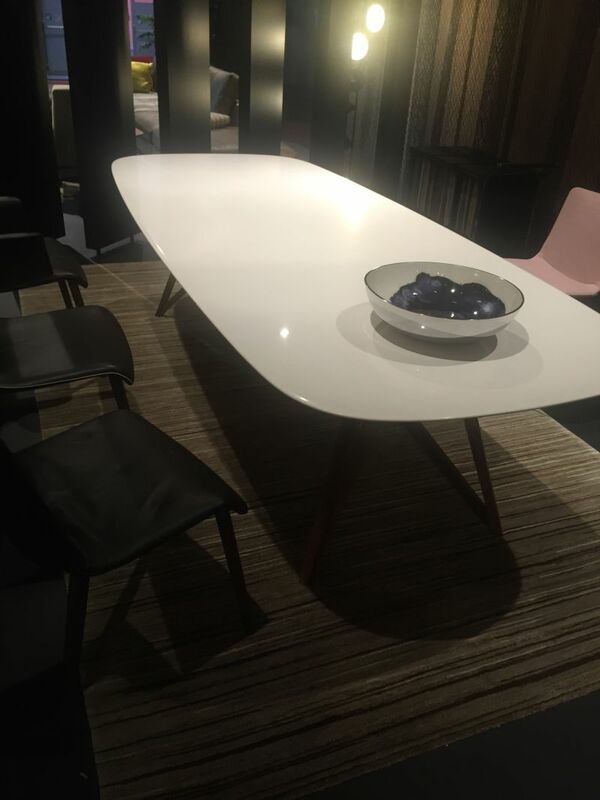 So, for example, a rectangular table can have a slightly curved top and its shape can be emphasized by the color, finish or material used. 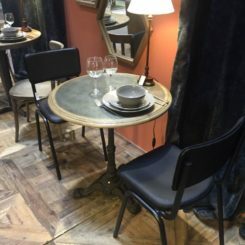 Instead of the standard dining chairs perhaps something a bit more comfortable and sophisticated could make a simple table stand out. There’s a lot going on here despite the simplicity of the decor. 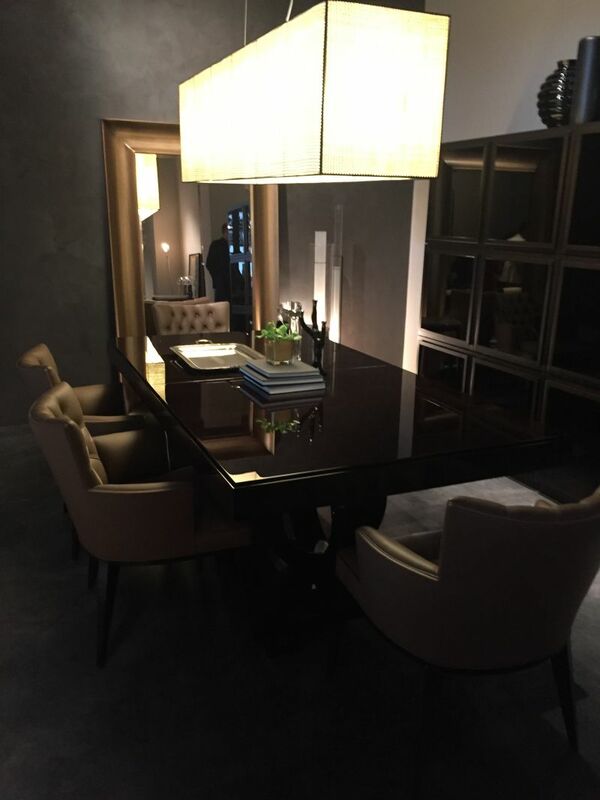 The table’s rectangular top is complemented by a matching light fixture as well as by the framed mirror casually leaning against the wall. 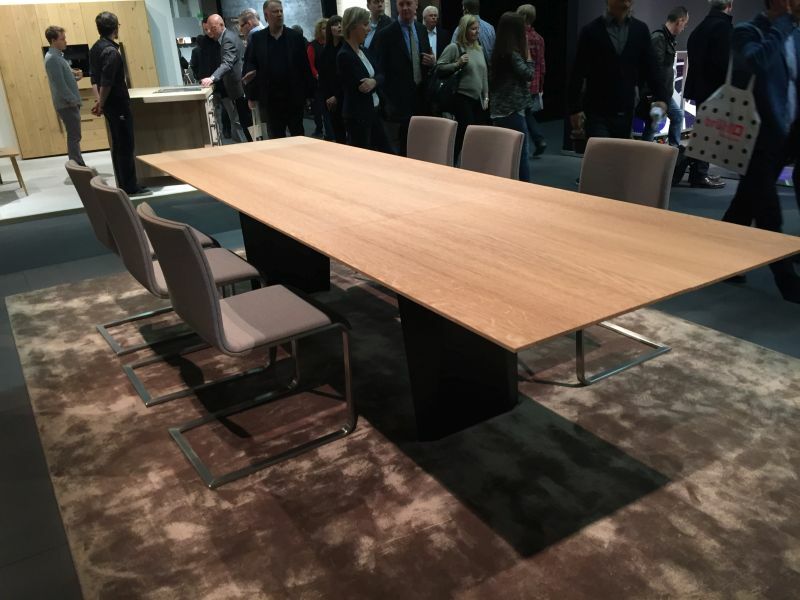 You never know when you’re going to need extra seats at the dining table so having one that can expand would come in very handy. It’s good to always be prepared. 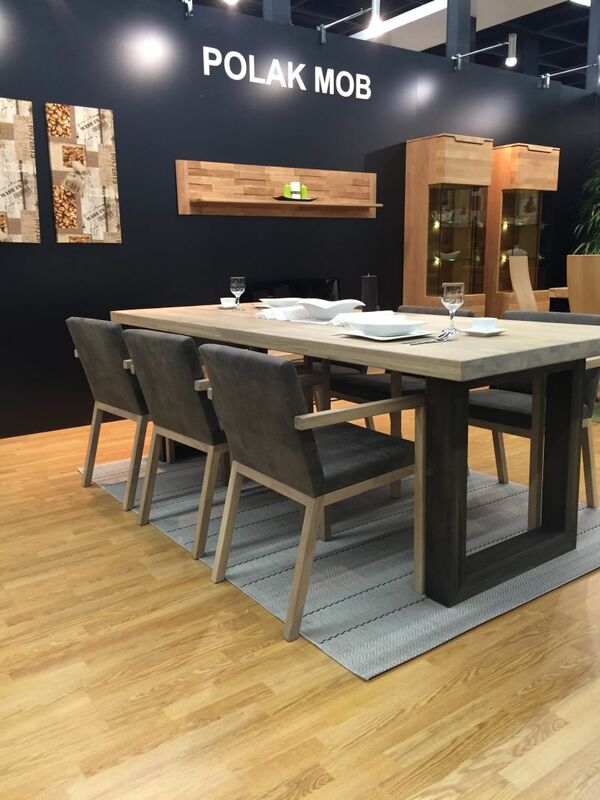 There are various different styles for expandable dining tables. The drop leaf models are quite common. Others are a bit more complex. 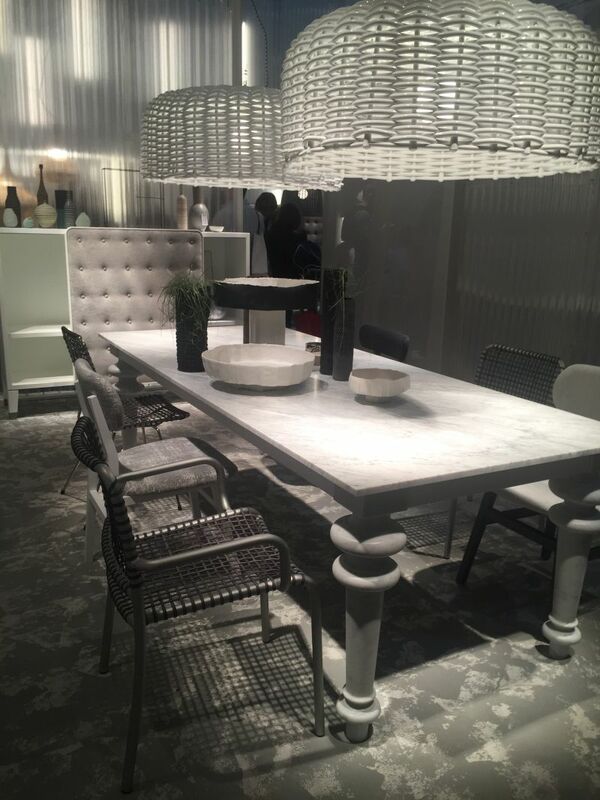 Most expandable tables would drastically change their look and size in just a few minutes or even less. It all depends on the system used for the design. 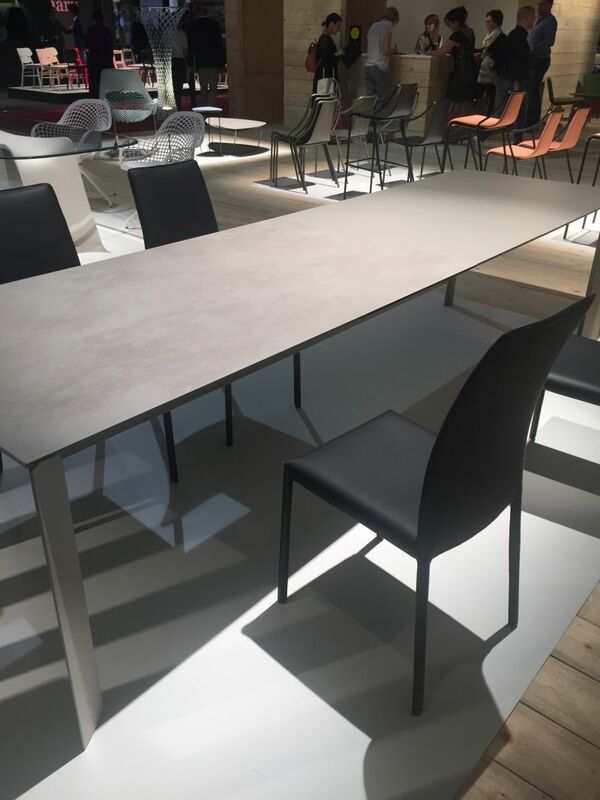 The sides of this table drop down when not needed, allowing the table to become smaller, more compact and to occupy less floor space. Some table models only expand on one side. 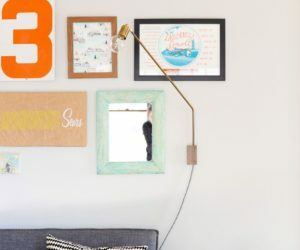 This means you can permanently position them in a corner or close to a wall and simply raise the extra side portion when needed without having to move the table. 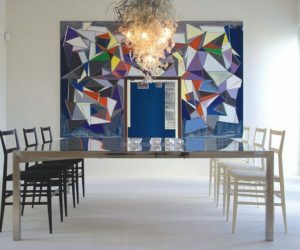 You can usually recognize an expandable dining table by its puzzle-like design. The top is made of up two or more pieces. However, that’s not always a clear sign that the table is expandable. 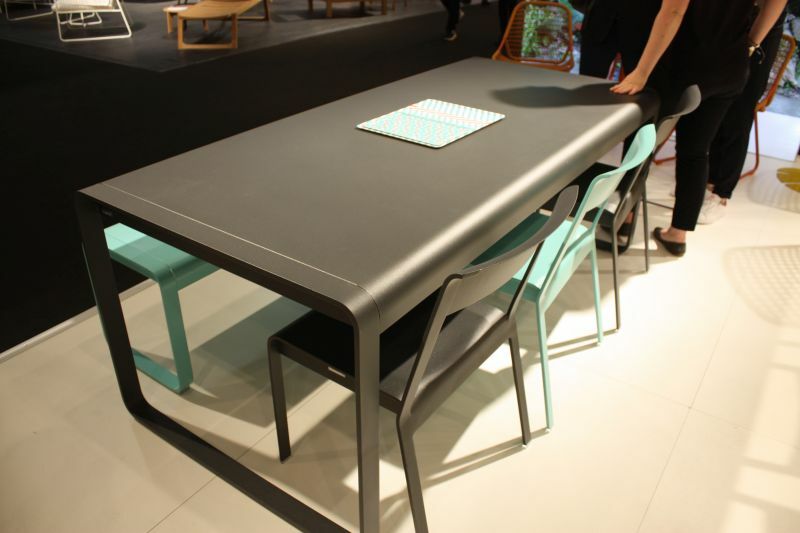 Expandable dining tables are particularly practical in the case of small homes. 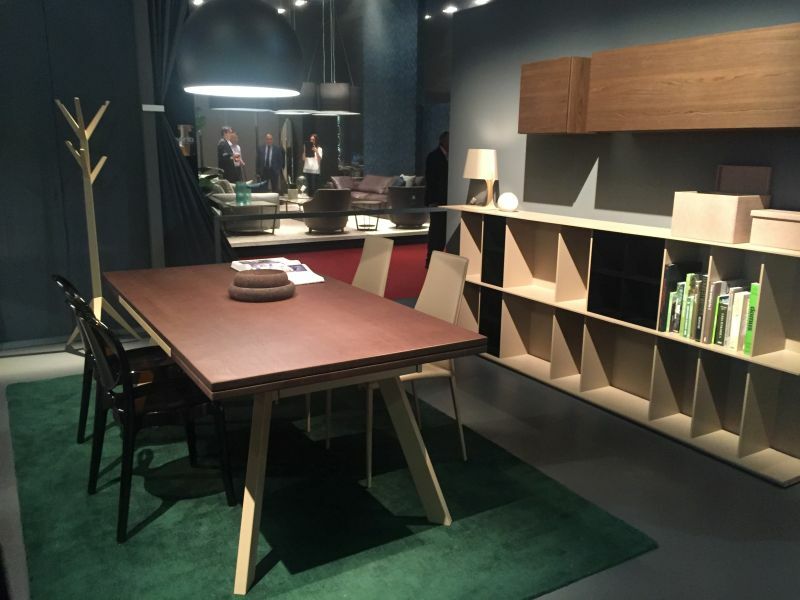 Also, they can be multifunctional and double as desks or even console tables when in their compact form. 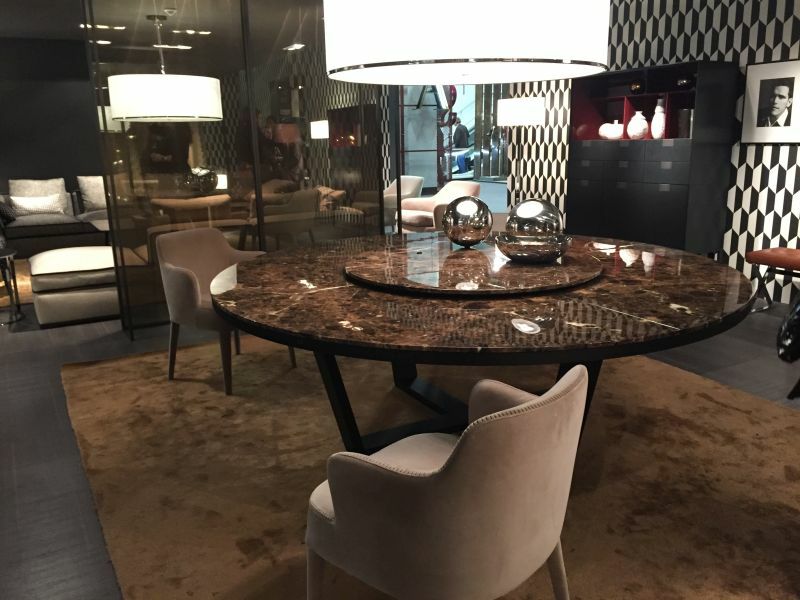 A dining table with an oval top is interesting for several reasons. First of all, such designs are not very common. Also, their designs are usually sleek and elegant. 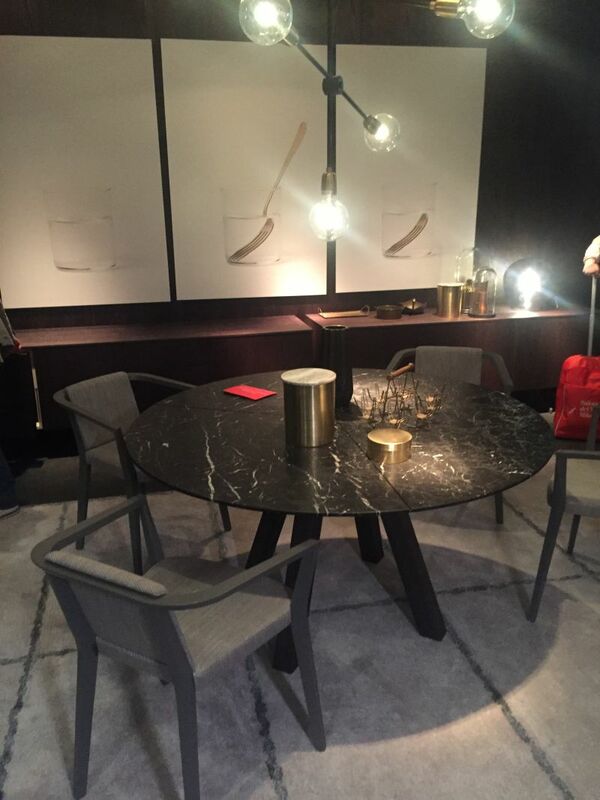 Apart from the aesthetic criteria, there’s no functional reason to choose an oval table over a rectangular one. They’re not more practical or noticeably more space-efficient. 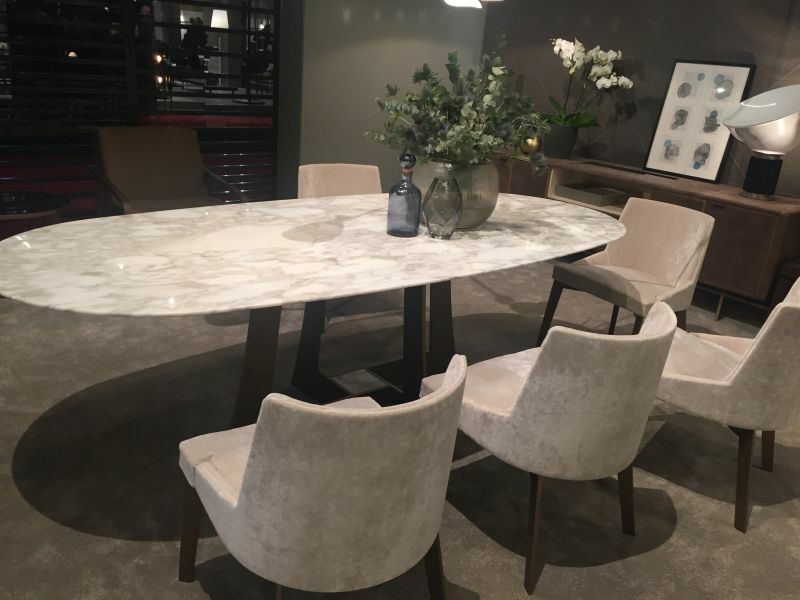 It is however true that the soft edges of an oval dining table can make the room seem less formal without necessarily making it look less elegant. This table is actually somewhere in between oval and rectangular. It doesn’t have that elongated shape others do but its edges are curved and smooth, making it look really cute. 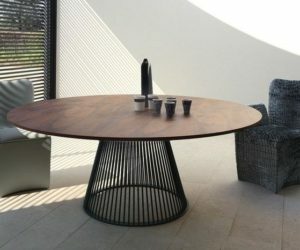 Apart from the actual shape of the top, this table has something else that makes it stand out. The slit at the center gives it a mysterious and intriguing look. 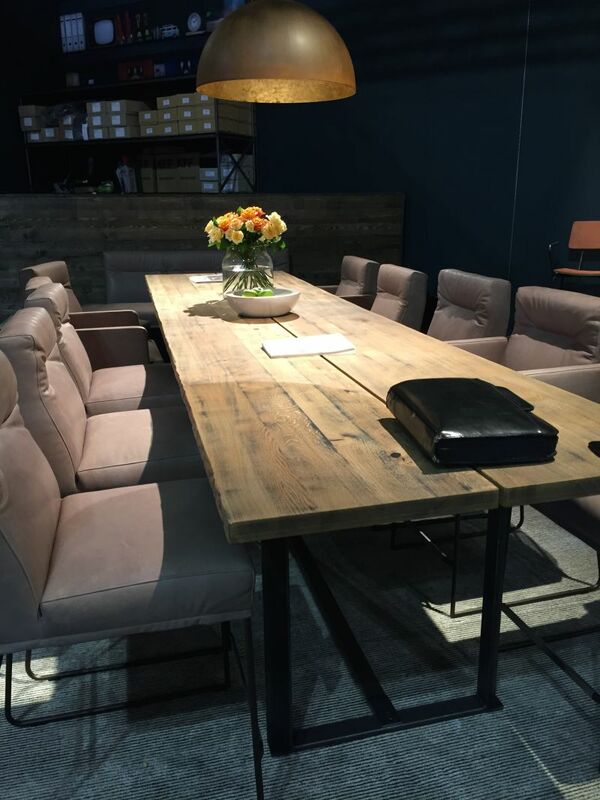 Both oval and round tables are better at making everyone feel comfortable than rectangular tables. They bring people together more easily through their designs. 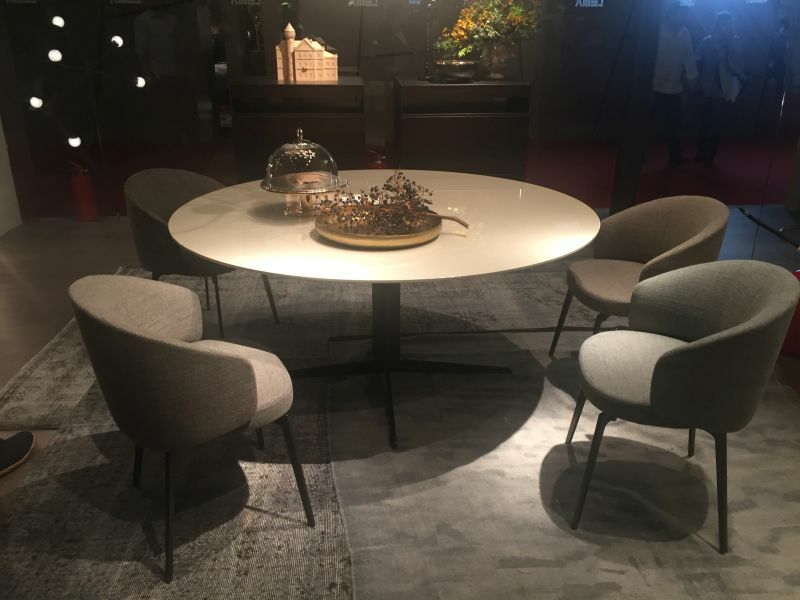 Highlight the beautiful shape of an oval dining table with a matching area rug that defines the area. They can also dialogue through color or they can complement each other harmoniously. 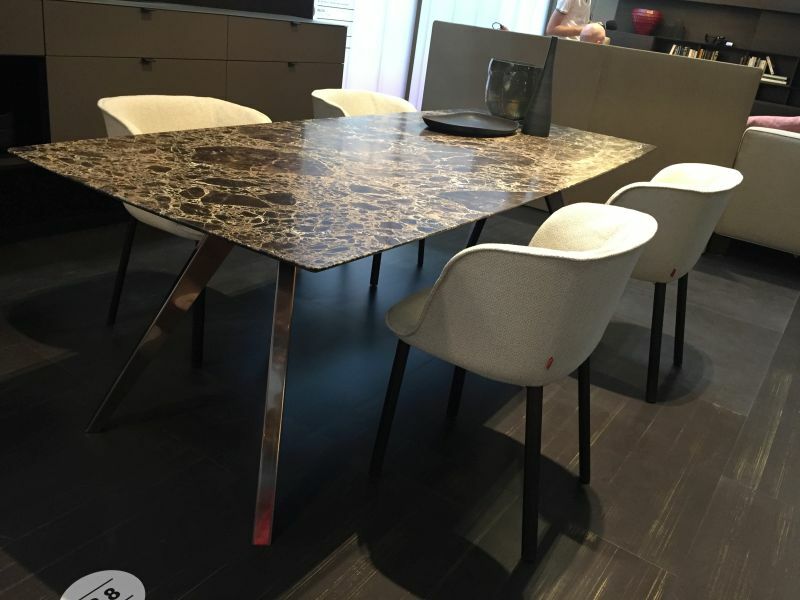 There’s a nice dialogue here between the marble table top and the upholstered dining chairs. 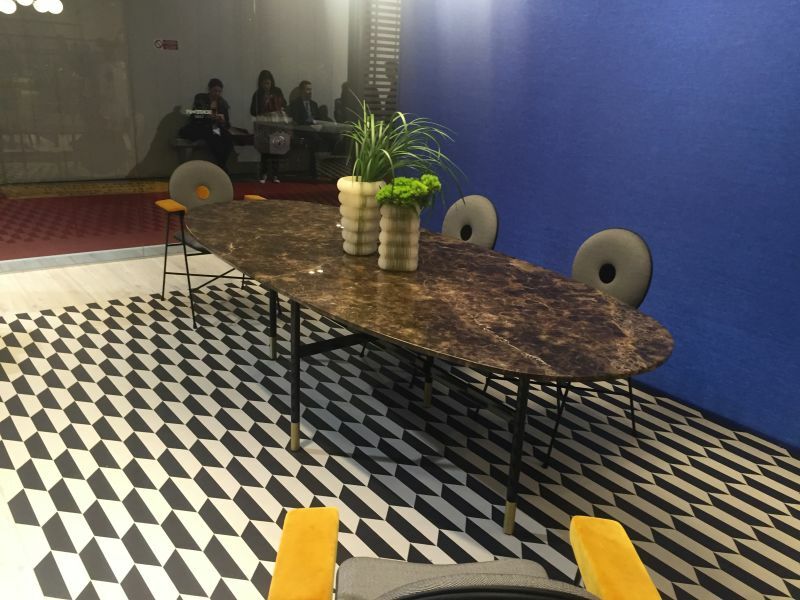 Further more, the oval shape of the table is complemented by the design of the chairs. 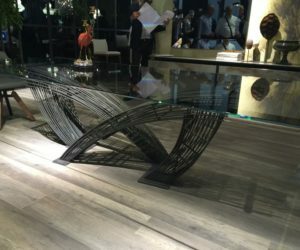 There are many ways to make a table with an interesting shape stand out. For example, make it contrast with its surroundings. The color can be a good criteria that allows you to do that. 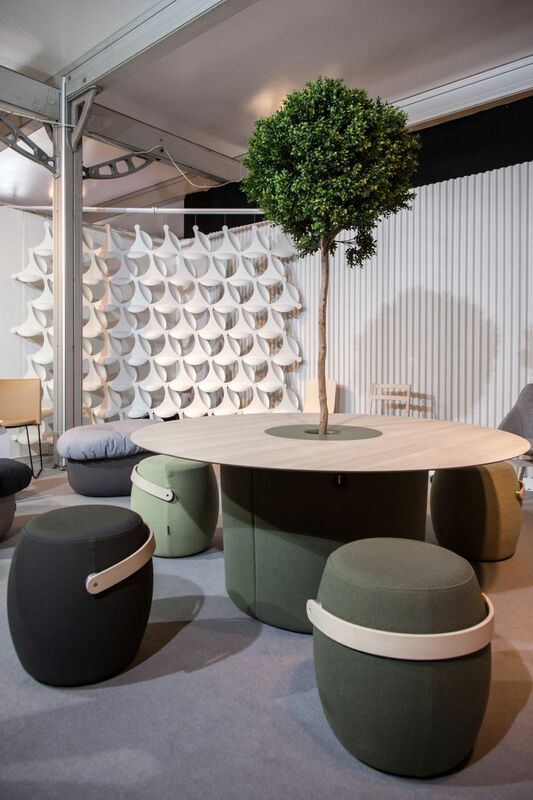 Round dining tables are the best at making everyone feel cozy and comfortable. They allow everyone to face each other and this way a more friendly ambiance is created. 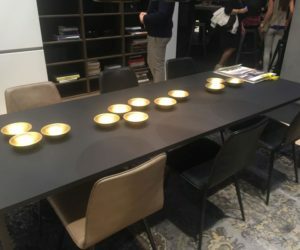 This is a really interesting table design. It appears that the base is a large planter and there’s a small tree at the center, growing through the round top. 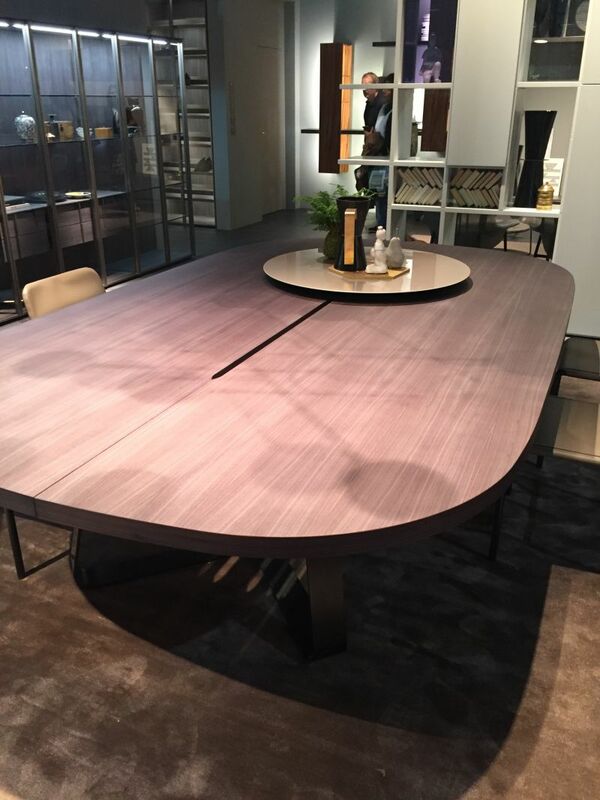 The beautiful round top of this dining table is highlighted by a lovely radiant pattern. It seems like a nice play of light and shadow. 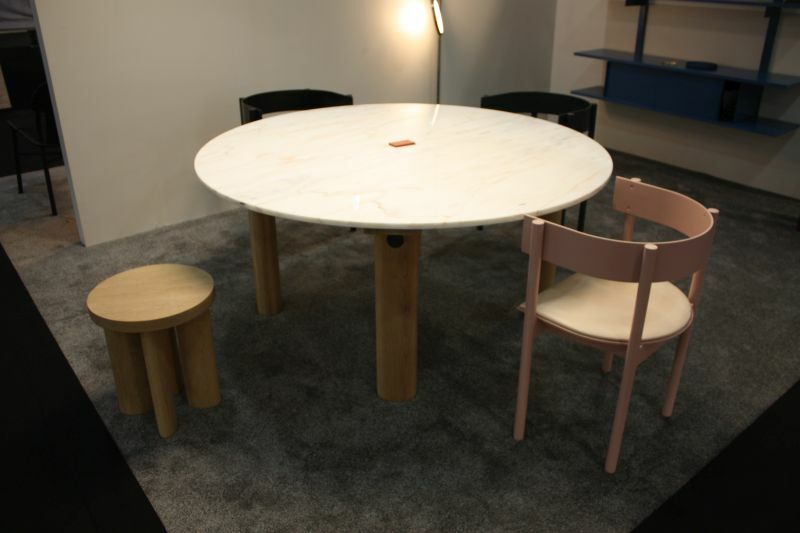 Round dining tables are usually pretty small compared to rectangular ones which can sit a lot of people. 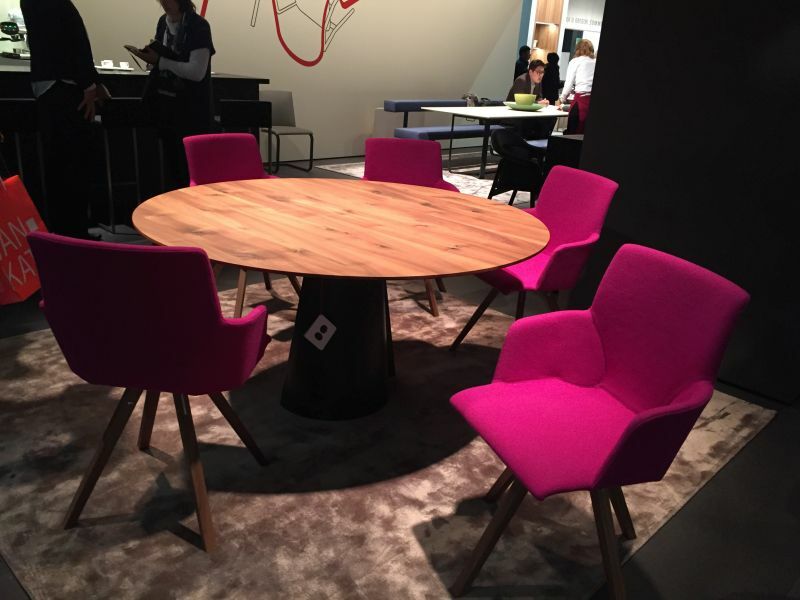 In the case of round tables the focus in on comfort. 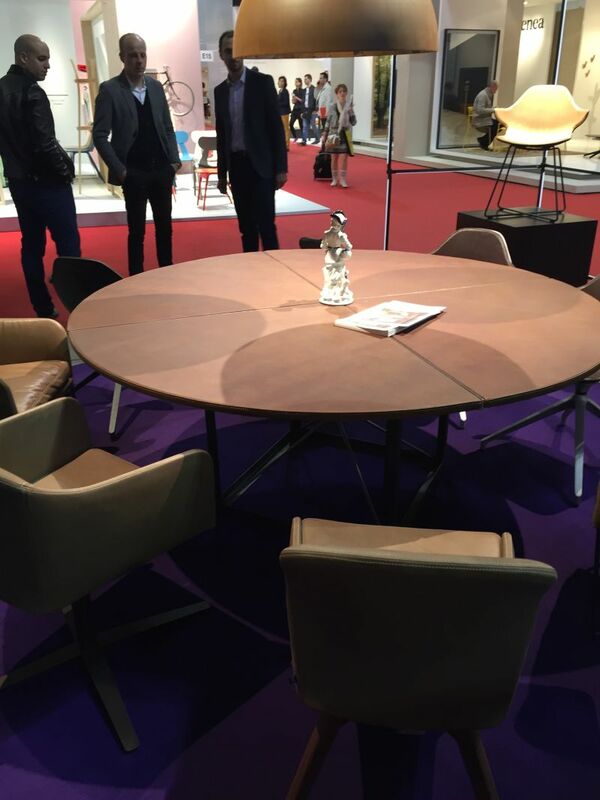 A round table for four can comfortably fit even in a very small room. Sure, round tops aren’t the most practical or space-efficient but they compensate in other ways. 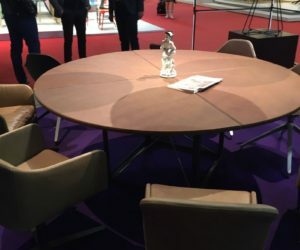 As with all the other types of tables, it can be interesting to complement a round one with chairs that also have round seats or curved designs. 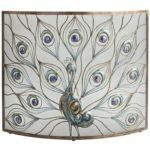 Similarly, choose to display a spherical or round light fixture above the table to emphasize their matching designs and shapes. 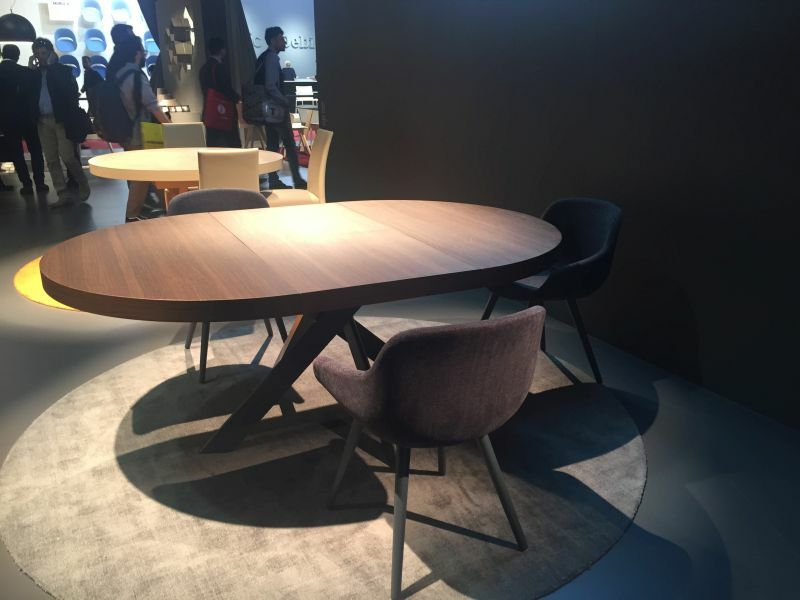 There are plenty of round dining tables that are also large. Some can sit up to 10 people. 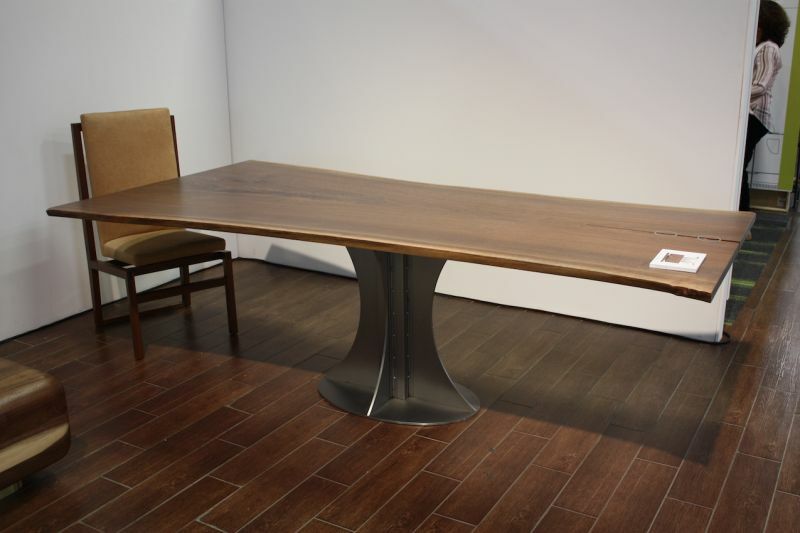 Of course, such a table would require a pretty spacious room to fit in. 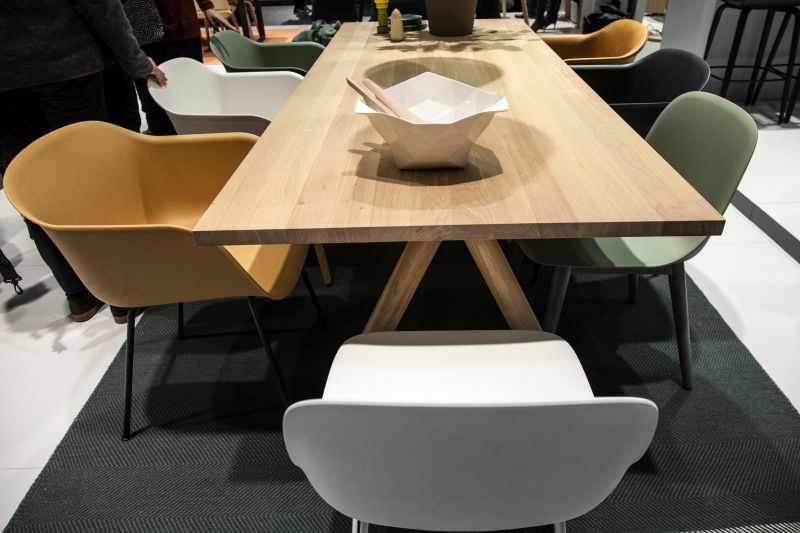 You might be tempted to squeeze more chairs than would normally fit around a round dining table. 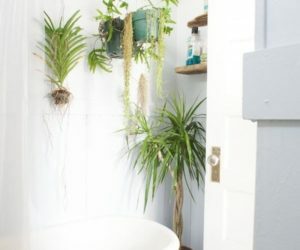 Leave enough space between them and keep in mind that the top is not that spacious either so everyone needs a good amount of personal space to feel comfortable. 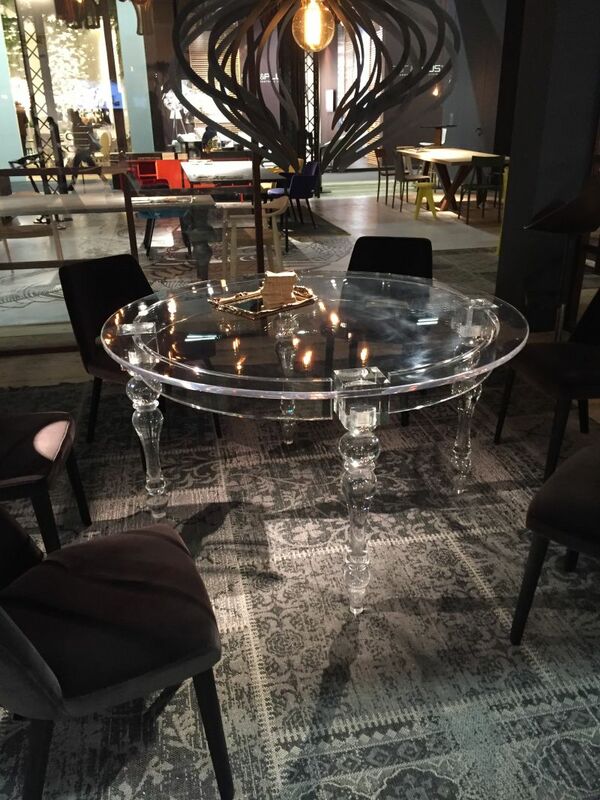 There’s a number of accessories that are meant to complement this round table. 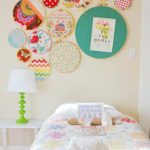 The wall art and light fixtures are the two most notable ones. 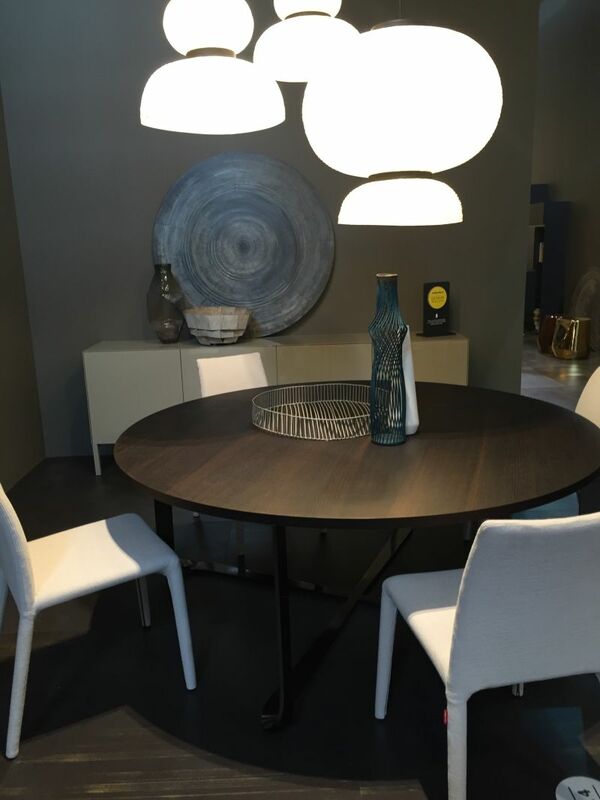 If you want the atmosphere in the dining room to be cozy, friendly and casual, a round table is a good choice. 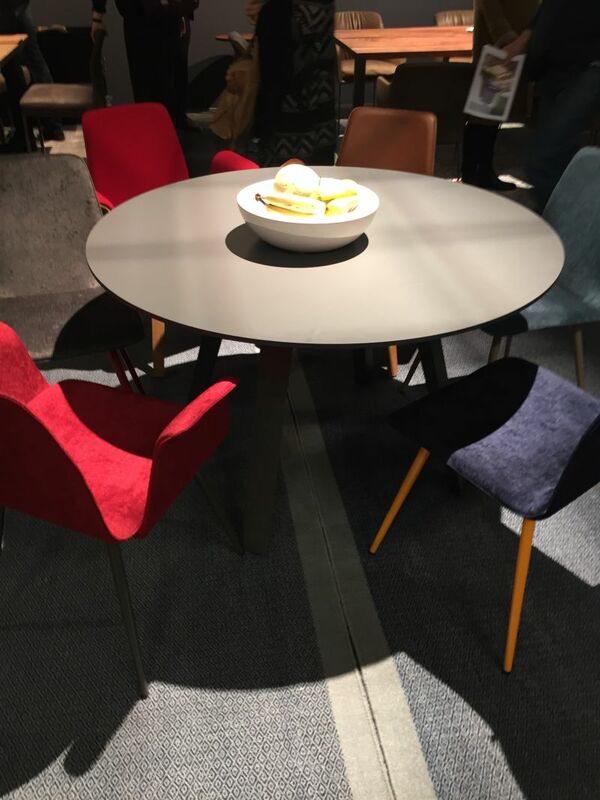 Consider placing chairs of different colors or with different designs around it to make the decor more playful. In fact, that’s a good idea regardless of what type of table you opt for. 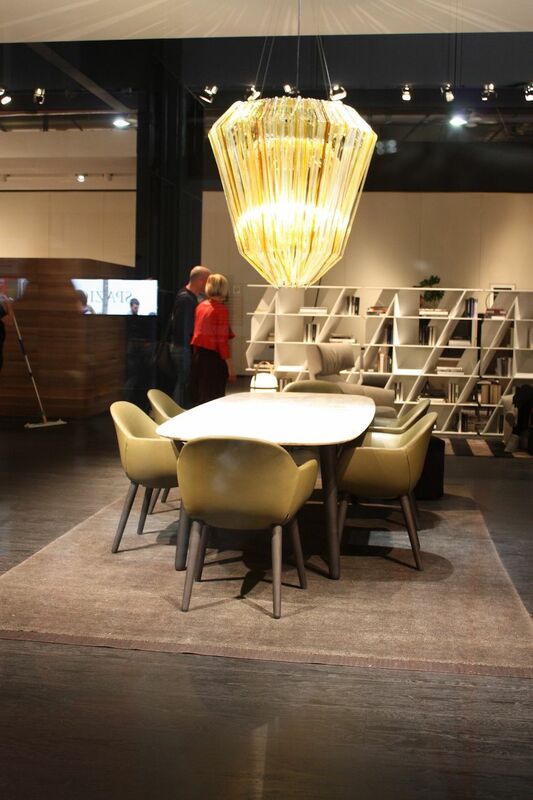 For example, you could put together classical, vintage, sculptural and modern chairs and even some stools and armchairs. 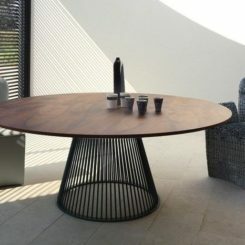 The round glass top of this table is meant to put an emphasis on the sculptural design of the base. Its transparency allows the design to be admired from all angles. 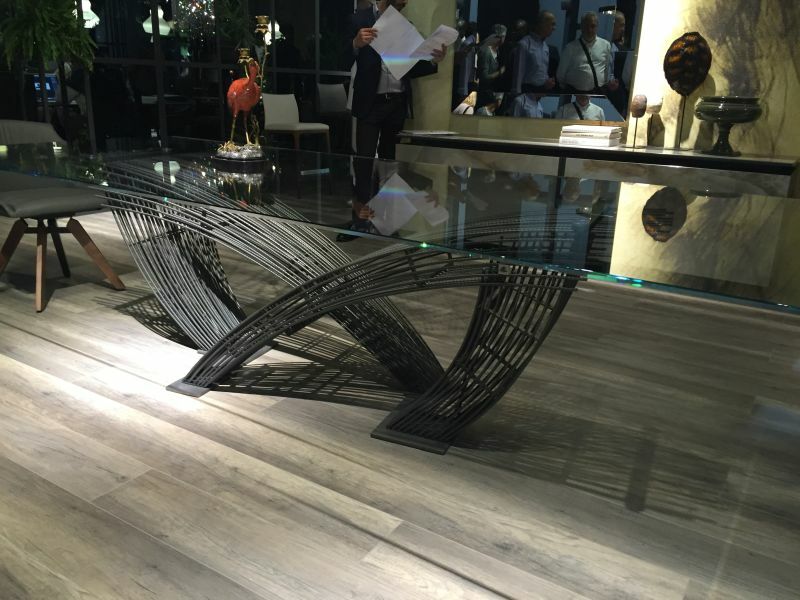 It’s hard to decide what’s the detail that makes this table so unusual. The tripod base is quite unusual, especially since it’s attached to the outer edge of the round top. Also, the twisted legs are not any less striking either. 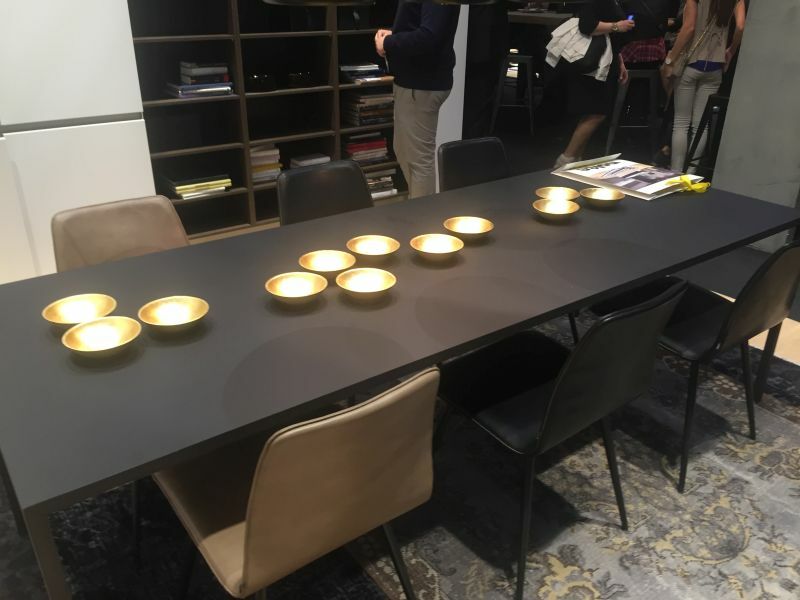 This robust and solid table looks a little bit like a chess piece, especially in this context, surrounded by these matching stools. It’s a really interesting and elegant look. This is a table with a double top. 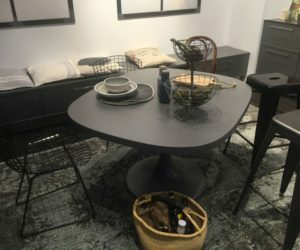 It actually has a raised platform at the center and that’s where you could place a centerpiece or gather the things you don’t want on the eating surface. 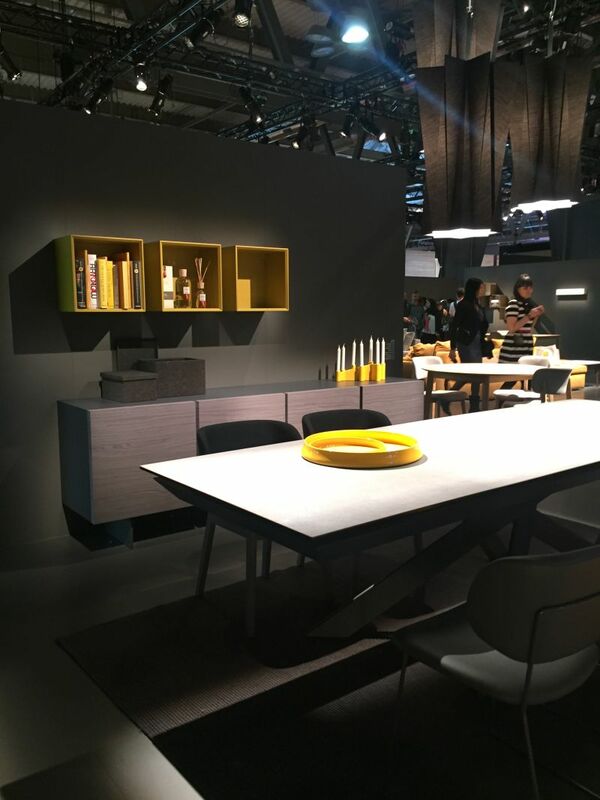 Material is just as important as size or shape when it comes to a table. 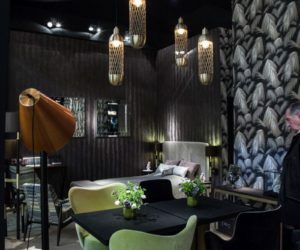 The right material can definitely set the right mood or create the right type of decor for the room. 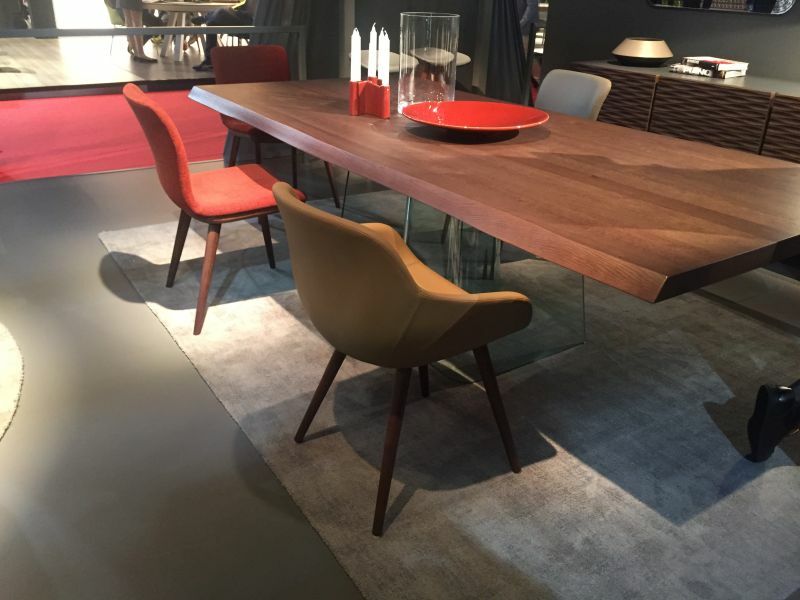 A wood dining table has the potential to add warmth and elegance to the room. 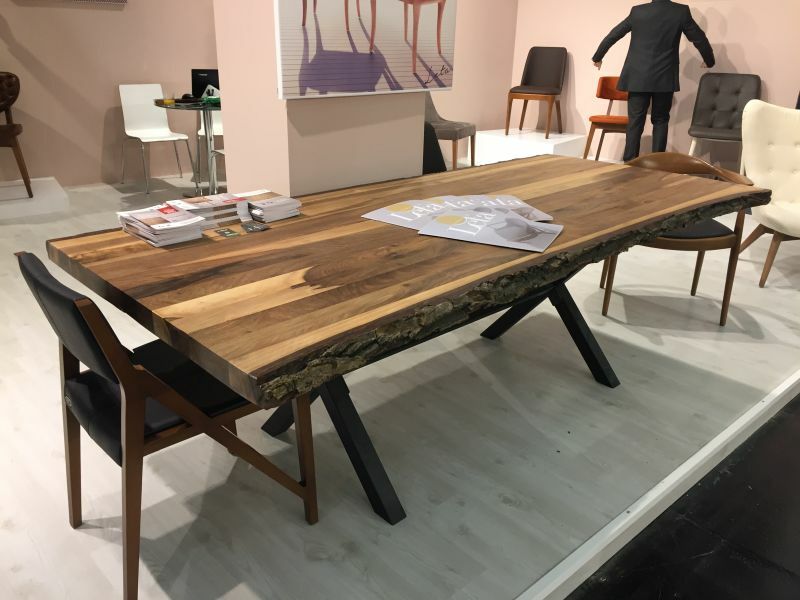 Live edge tables are especially charming that way and this one is a wonderful example. 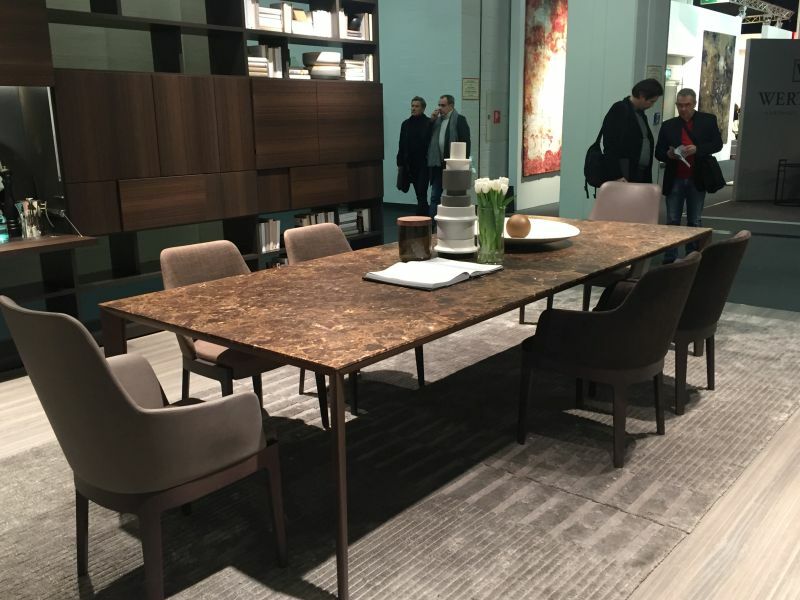 Whether the table is made of solid wood or given the impression of being built this way it makes little importance in terms of looks, especially if you also choose to match it to a cabinet or another piece of furniture. 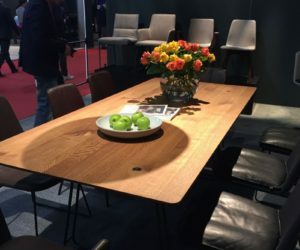 We love the simplicity of this wooden table. 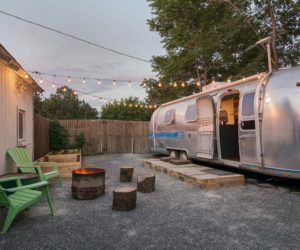 It has a simple solid top and a sleek base that provides stability while also being practical and comfortable, allowing plenty of leg room under the top. 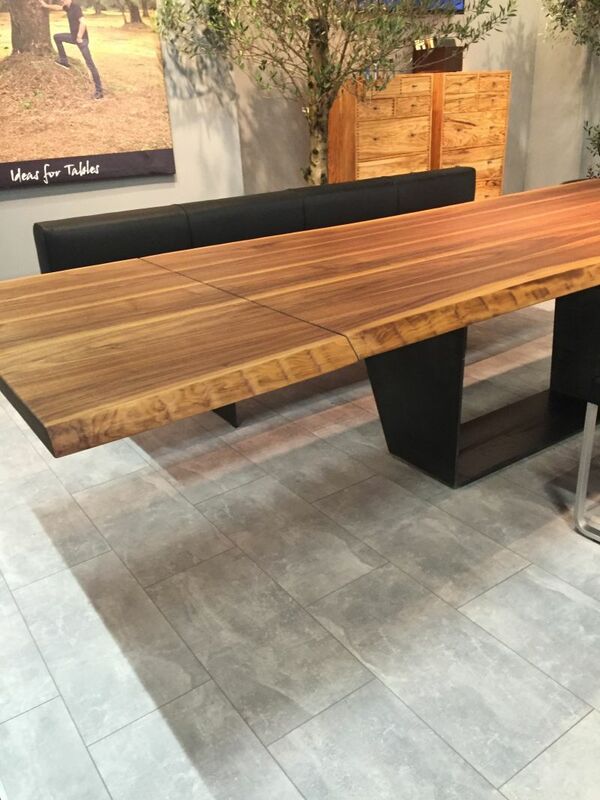 Each wooden table is unique just like each tree is a one-of-a-kind specimen. This is one of the details that make wood furniture in general so popular and so timeless. 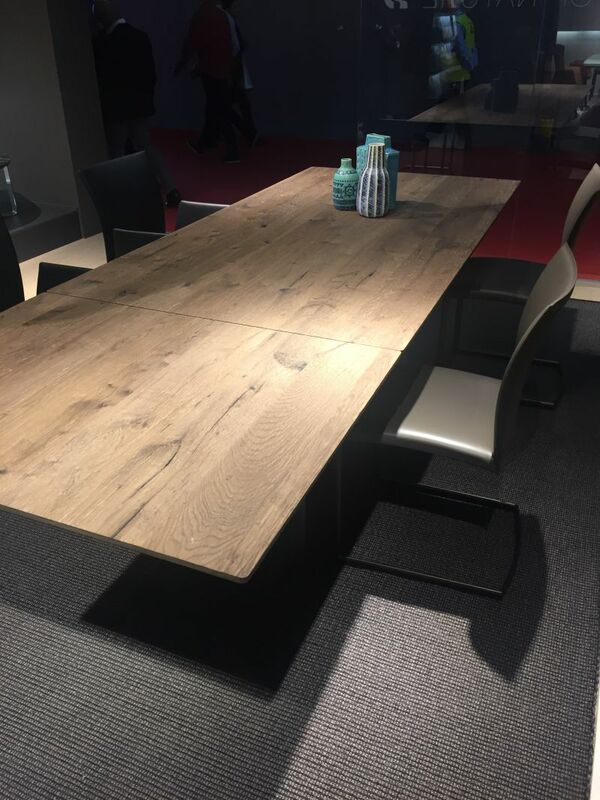 Match the table to the floor to establish a sense of cohesiveness in the room. After that, you can find lots of other ways to mix and match things for a harmonious look. 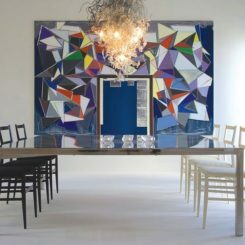 Some dining tables are designed to celebrate the material they’re made of. 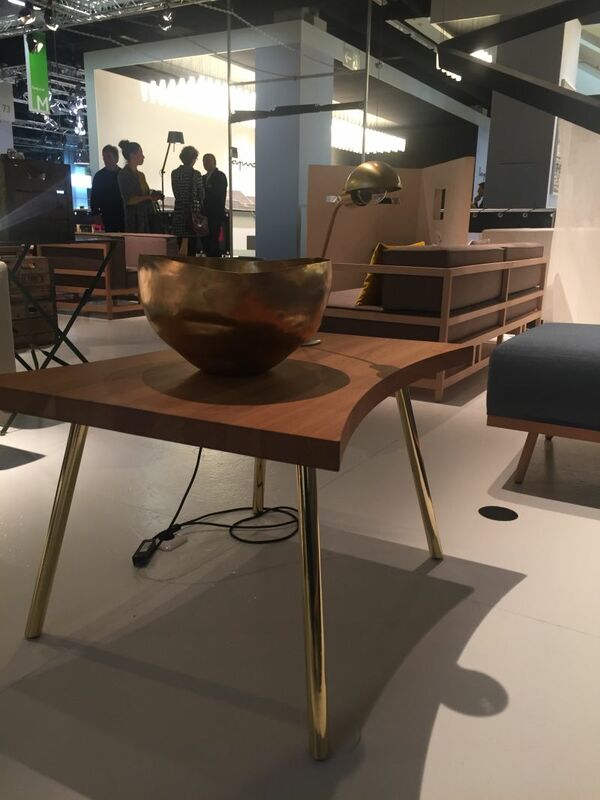 This one, for example, emphasizes all the unique and beautiful things usually associated with wood such as the grain, the color, texture and warmth. 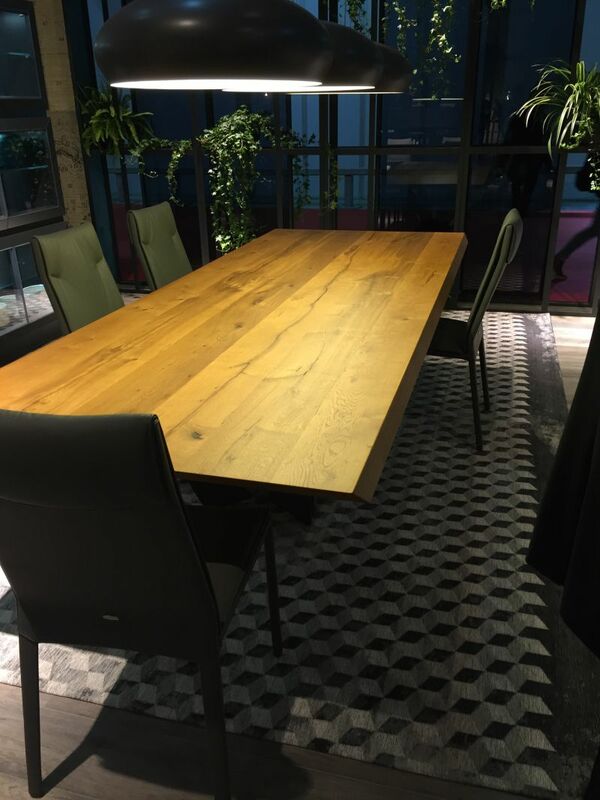 Although this table doesn’t have a thick and solid wooden top, it still manages to capture the beauty and charm of the material. The thin and sleek top allows it to look lightweight and less bulky. 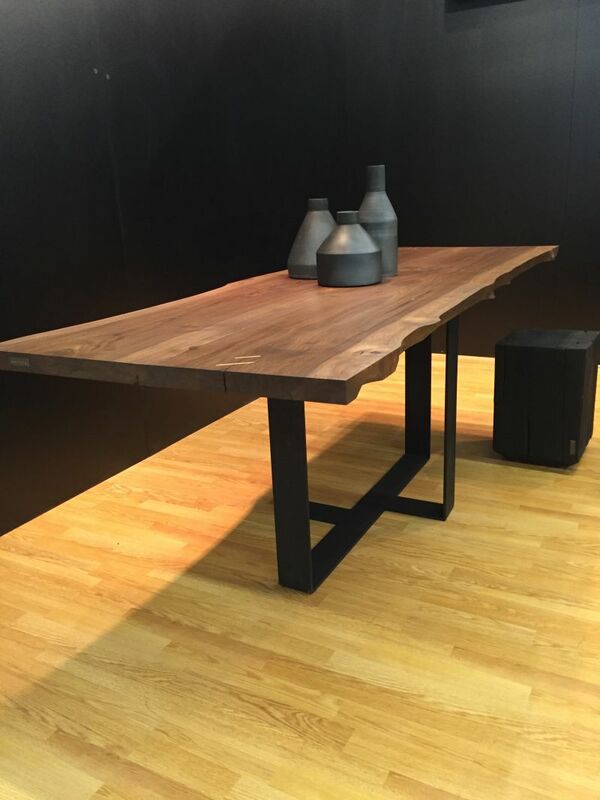 Bring out the beauty and natural color of the wood by using it in combination with something contrasting in a way similar to how this table uses black to highlight the wood’s beautiful grain. 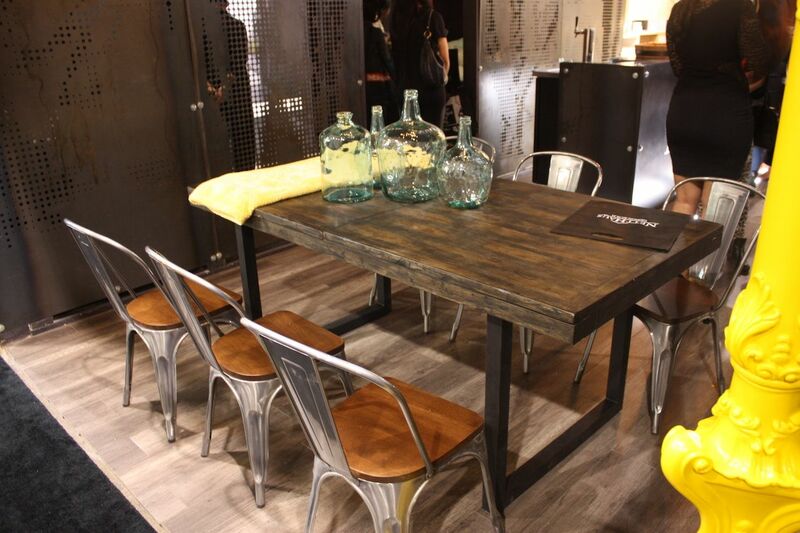 Tables like this one definitely have a strong rustic vibe. 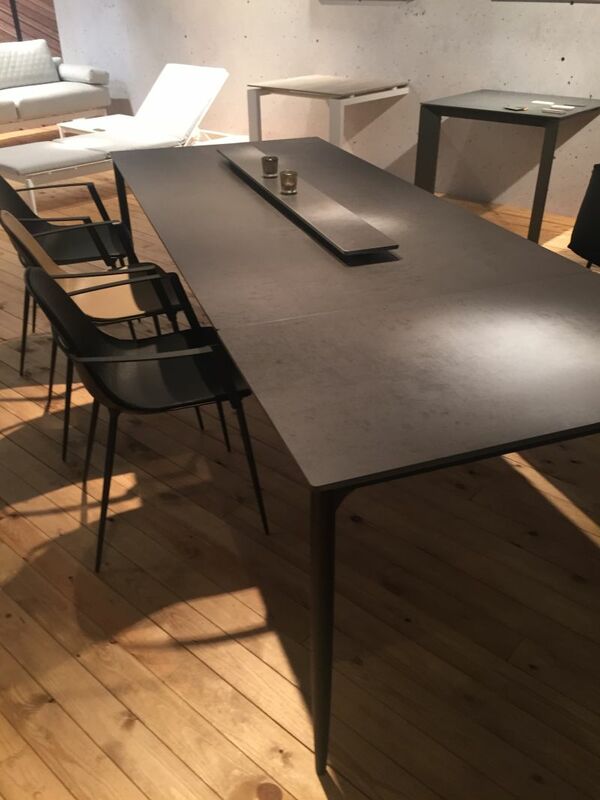 It has to do with their elegant roughness, the coloring, finish and the design as a whole. 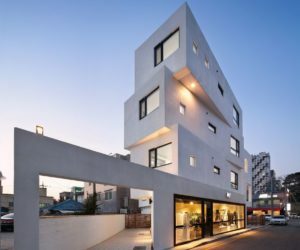 Given the right context, such a design can really shine. 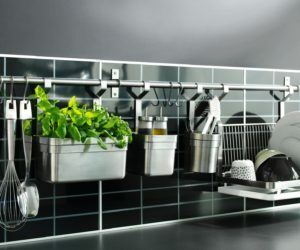 On the other hand, designs like this one are better suited for modern environments. 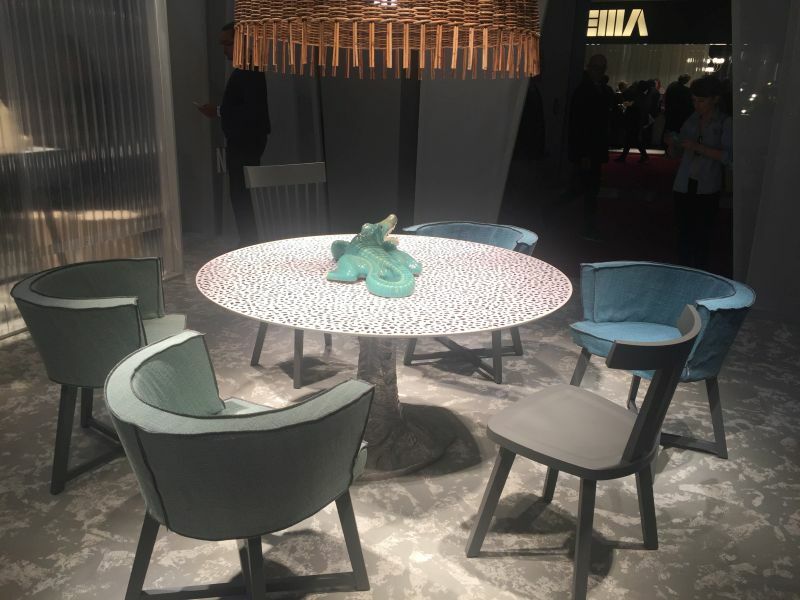 We love it how each chair has a different color and how their designs are also slightly diversified. 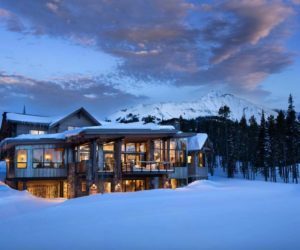 Certain combinations of materials are better suited for specific styles. 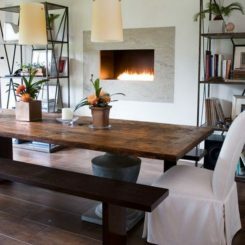 The wood and metal combo, for instance, is perfect for industrial space although it can also look lovely in a rustic or modern room. 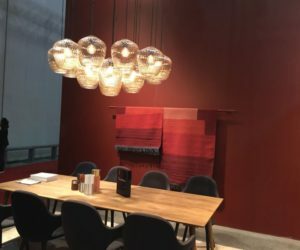 The red and black really bring out the beautiful honey color of the wood so perhaps you can let this decor inspire you when decorating your own dining room. Adequate lighting can have a similar effect. 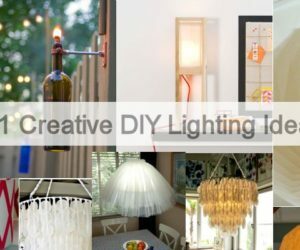 In fact, lighting is very important in general when in comes to dining rooms. Large chandeliers or sets of pendant lights are preferred for this space. 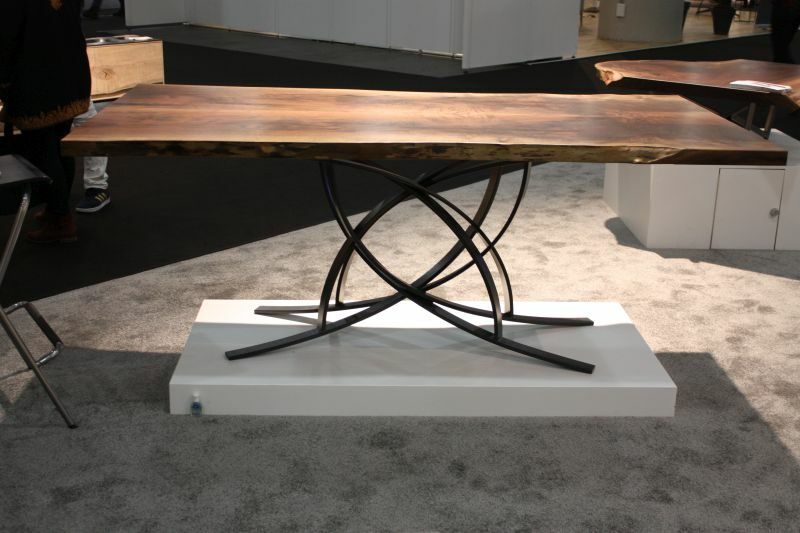 The simple but sculptural and eye-catching base of this dining table gives it a really interesting and striking look. Moreover, the combination of colors and materials adds even more charm to the design. That’s a pretty bold and interesting design as well. 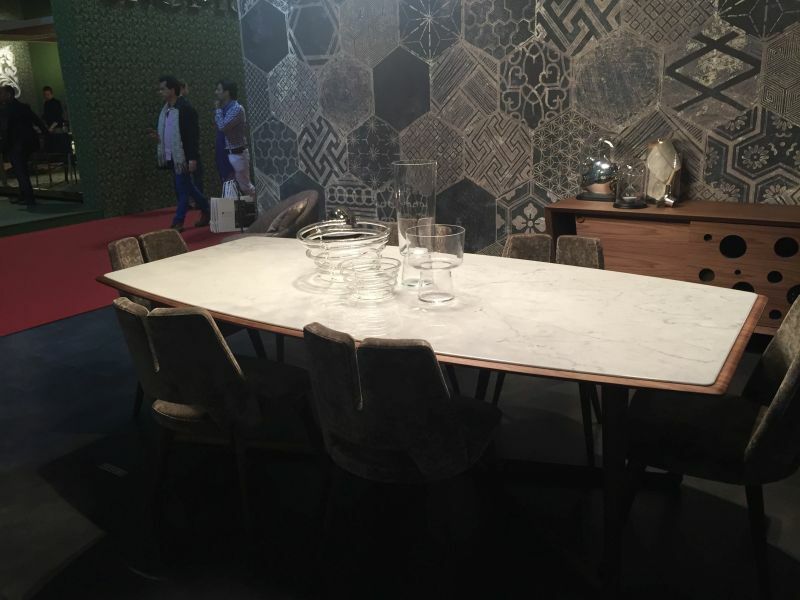 Although the pattern is not exactly to die for, it does make the table stand out in a subtle but still strong manner. Try to find the balance between the warm and cool color tones and all the materials used in a room. 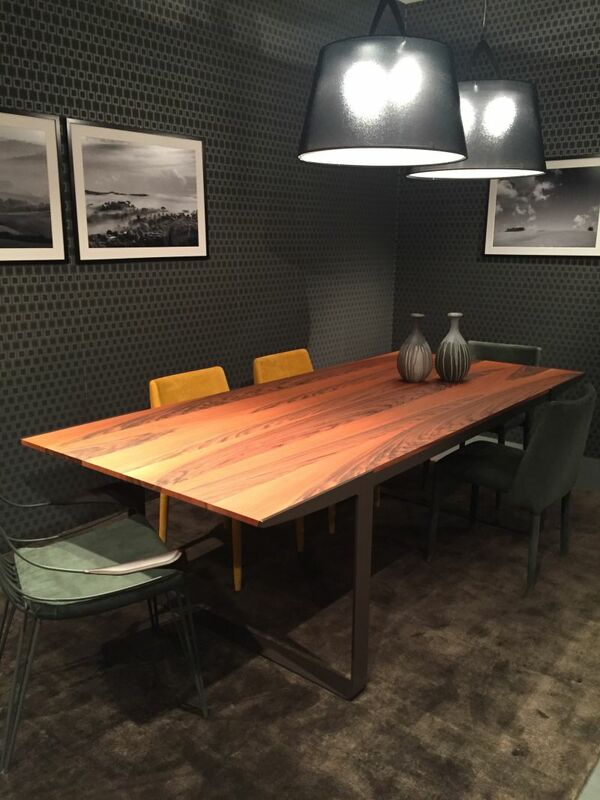 A wood dining table could be paired with metal chairs and a mixture of colors from both sides of the spectrum. Marble is a material with lots of unique characteristics. It’s very appreciated for its antibacterial composition, being used in kitchens in bathrooms. This detail also makes it a good choice for dining tables. 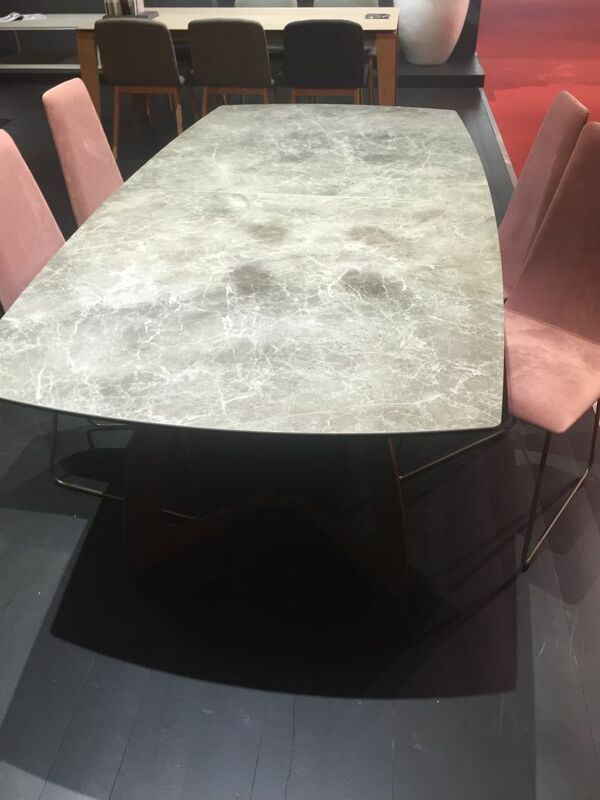 A marble top dining table would stand out regardless of the style and decor of the room you place it in. So it could be a good idea to keep everything else around it simple and neutral. 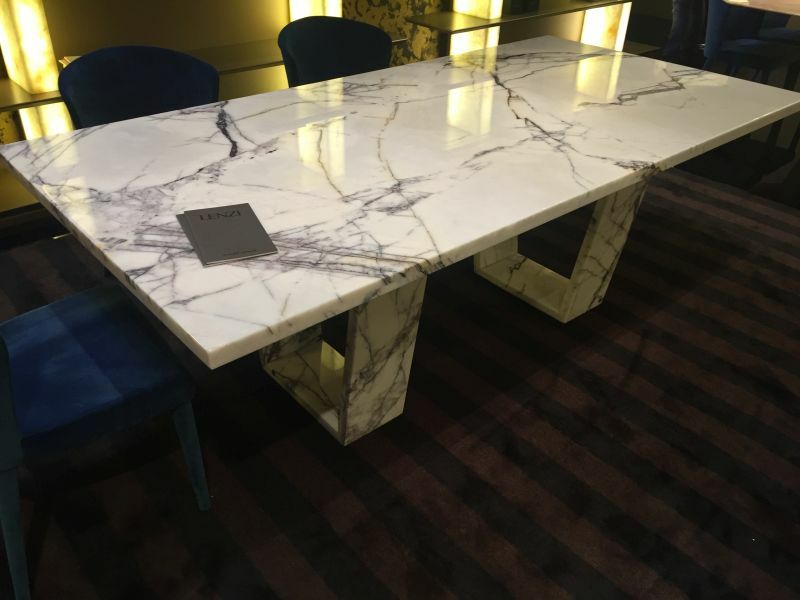 For this table, the top isn’t the only part made of marble. 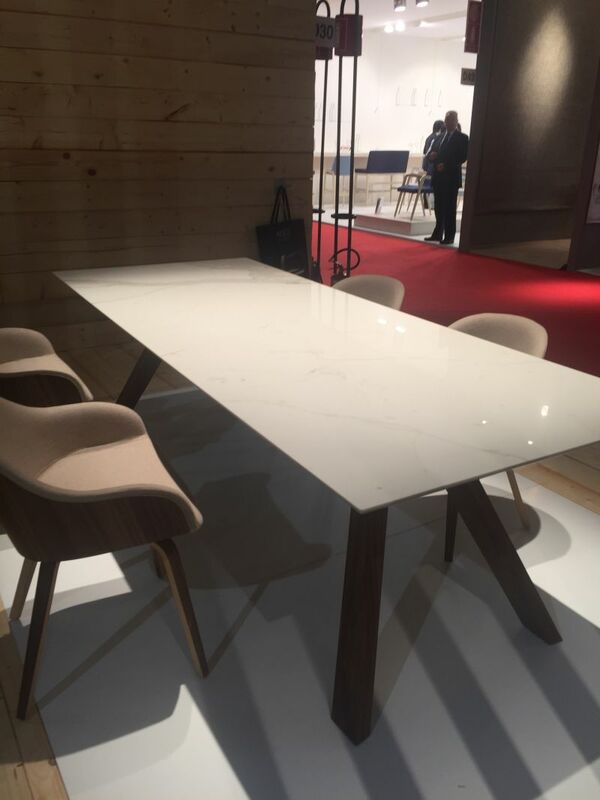 This is a full marble dining table with a simple and modern design. 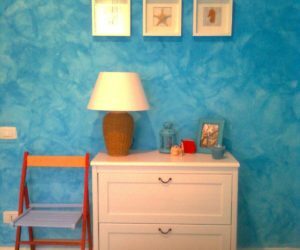 Its light coloring keeps the room bright and airy. 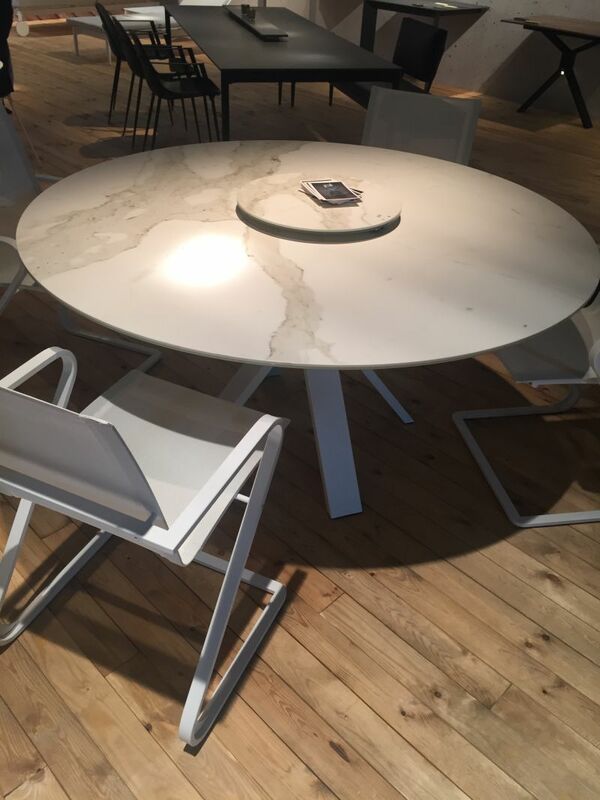 There are many different types of marble, each one with its own set of unique and special characteristics. Although there are some very expensive types, a lot of them are actually very affordable. 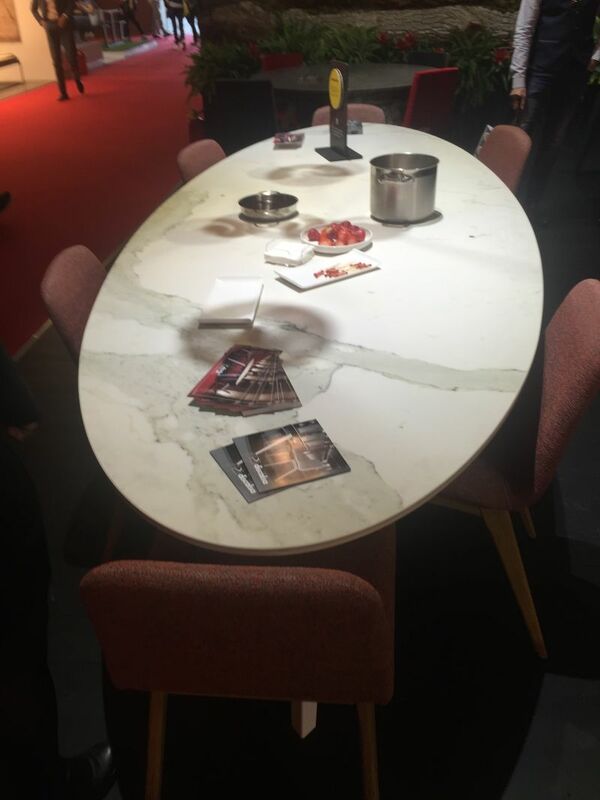 Keep in mind that marble tables and counters need to be regularly treated for a good maintenance in order to make sure they look just as beautiful after years of use. 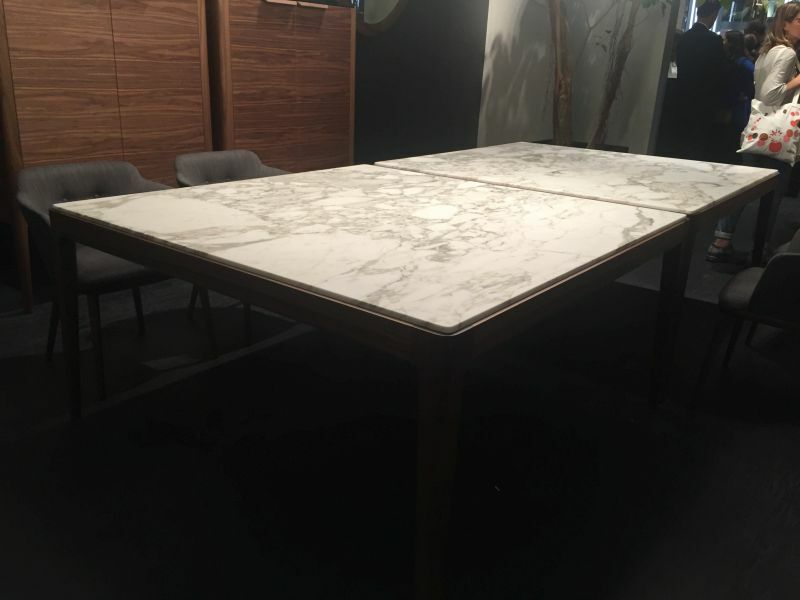 One of the key features of a marble dining table is the unique pattern of the veins and the natural coloring. 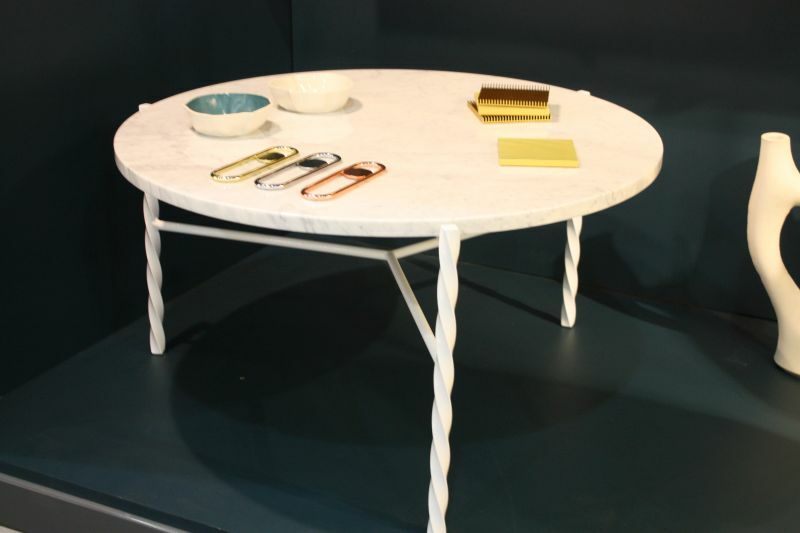 These elements allow the table to become a focal point for the room. 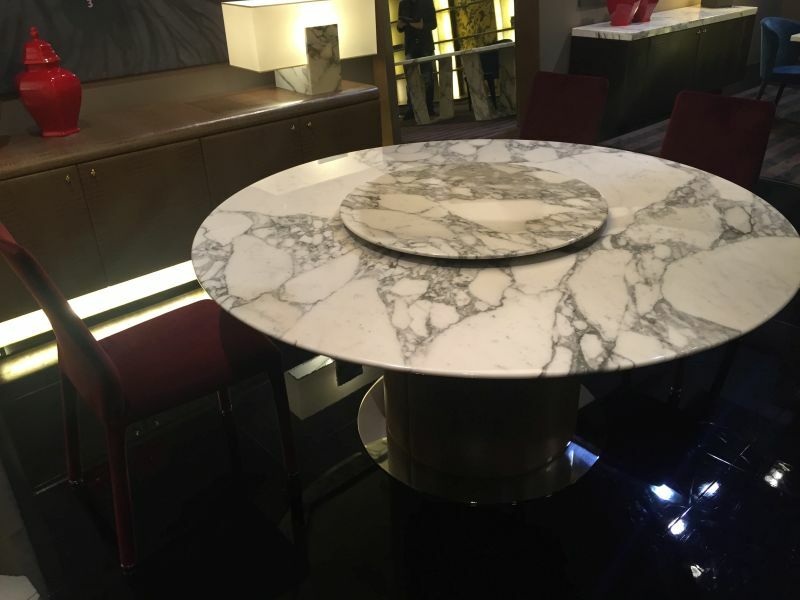 As with any material, there are both advantages and disadvantages to take into consideration when choosing a marble top dining table. For example, marble scratches easier than other materials. You also need to keep in mind that marble stains easily, especially if not treated properly. 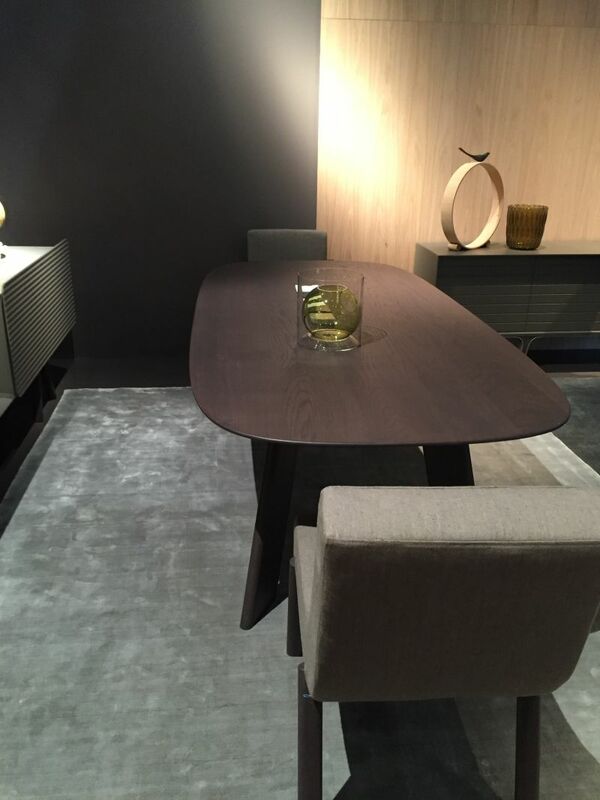 This is important for a dining table but a darker color or a richer pattern can conceal better conceal the stains. 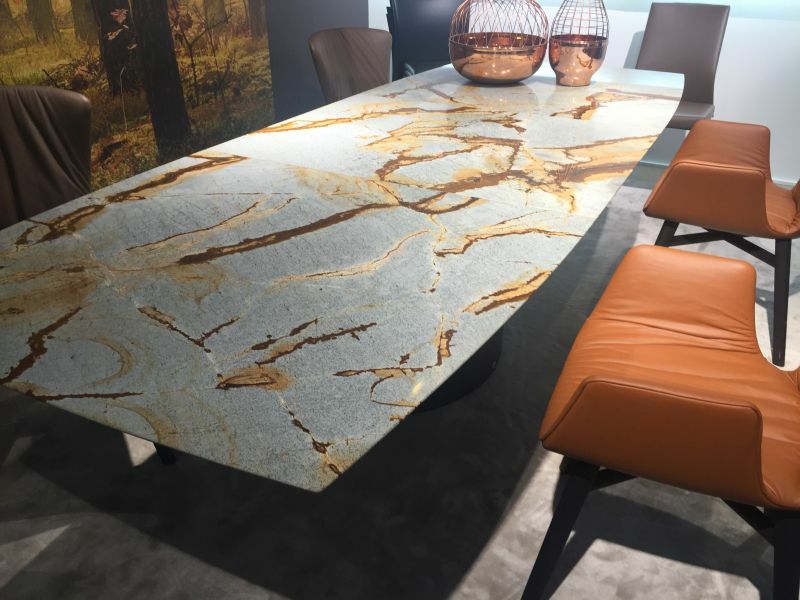 It’s an interesting idea to pick a more unusual material or color for a dining table that’s not particularly large or doesn’t stand out in any other way. 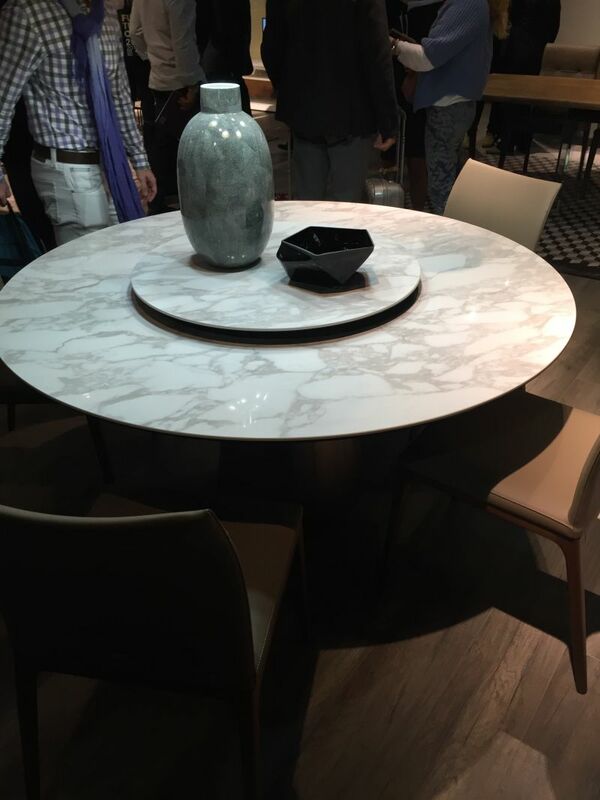 Play with contrasts to emphasize certain elements such as the natural beauty of a marble top. 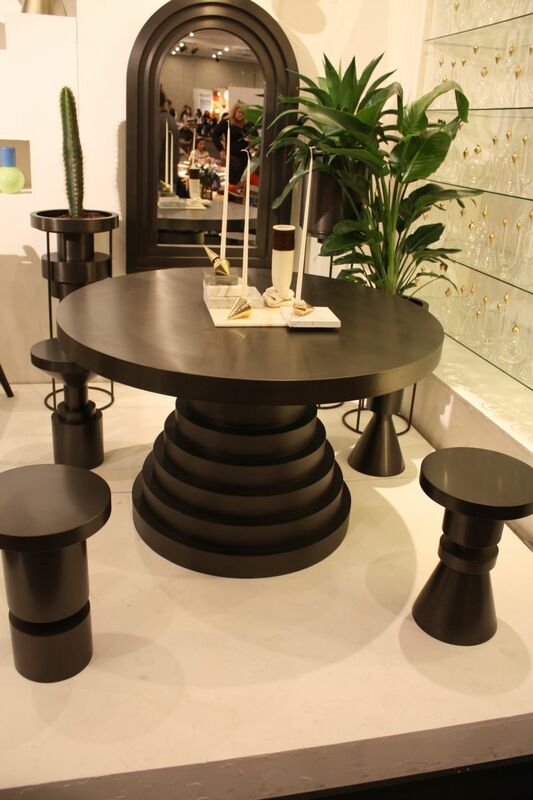 This table, for example, has a black frame which is an elegant touch. Marble isn’t the only material that features the characteristics described so far. 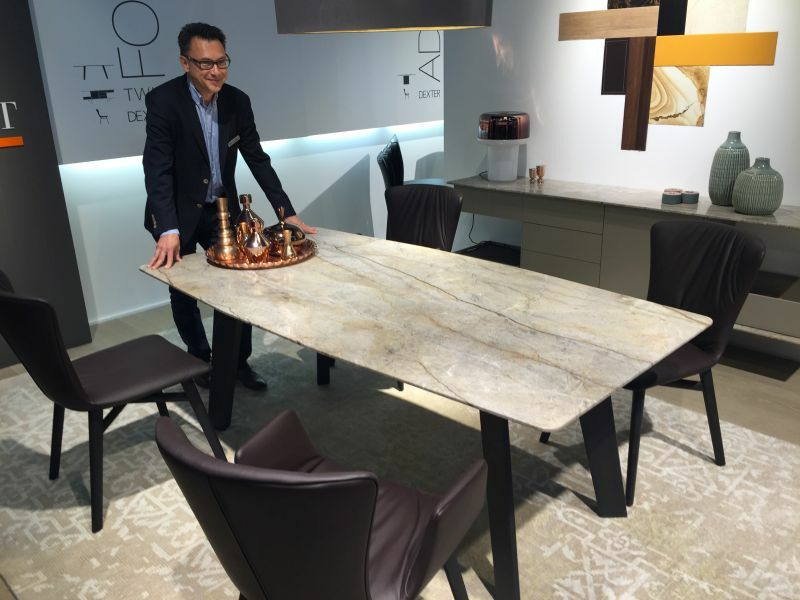 Other similar options include granite or quartz. 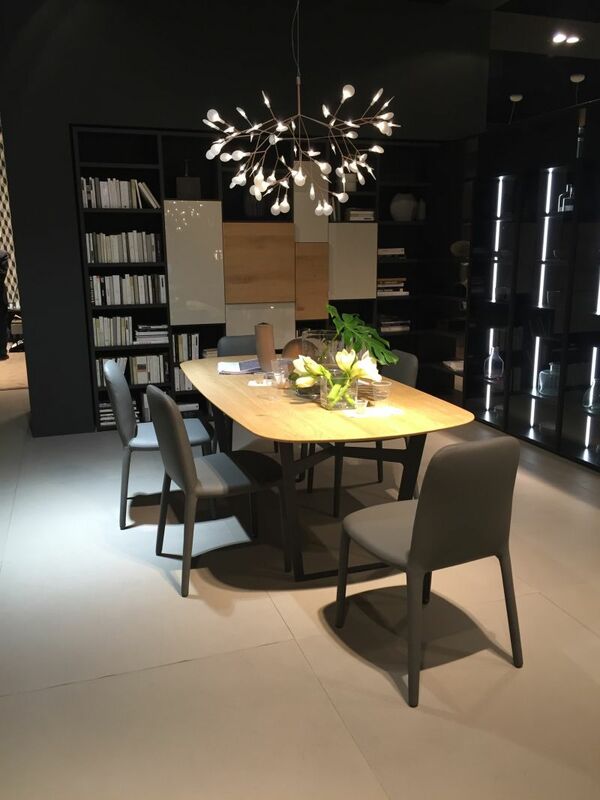 The size of the dining table needs to be just right for the space. 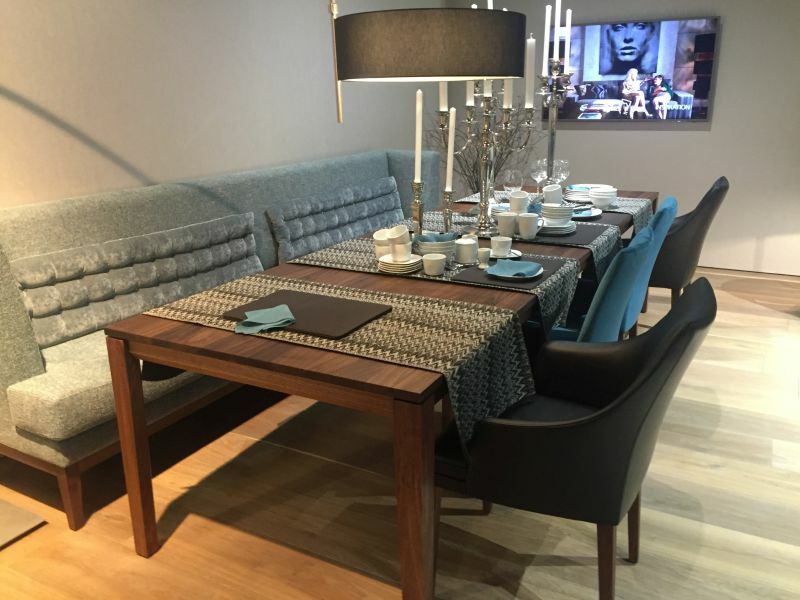 A table that’s to small or too large would make the space feel cramped or incomplete. Don’t feel discouraged if you have a tiny dining area. 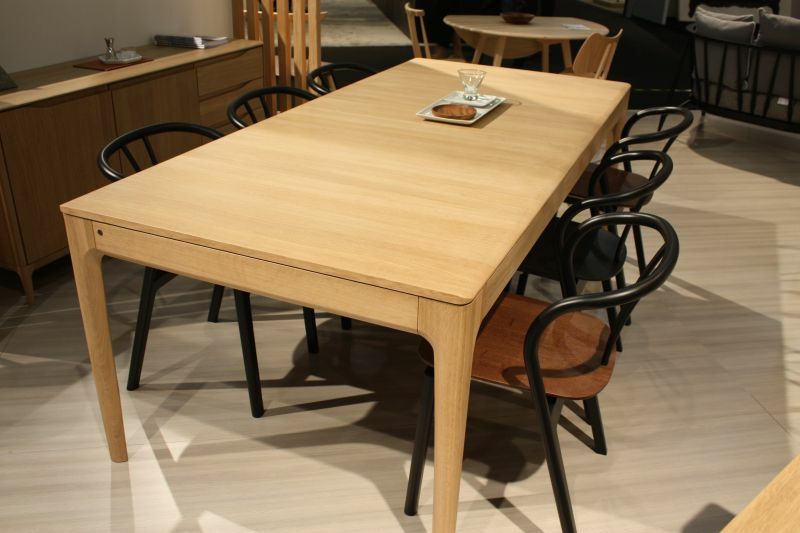 There are plenty of stylish options for small dining tables. 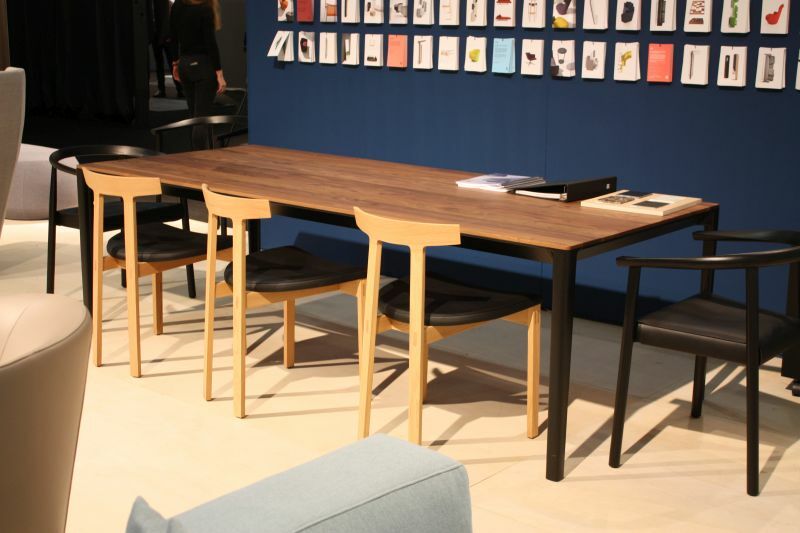 By small we mean a table that can sit anywhere between two to six people. 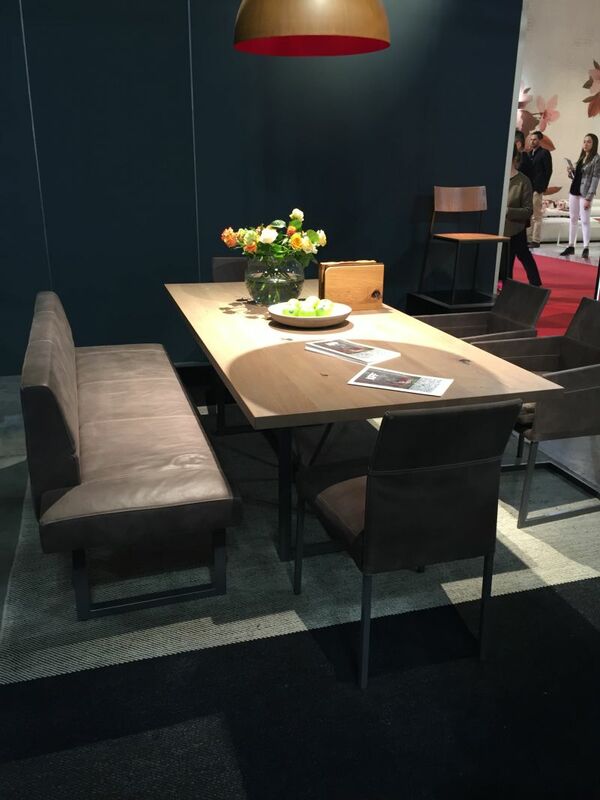 If you prefer a modular and flexible approach, you can put together two square dining tables for two to get a larger rectangular one when needed. 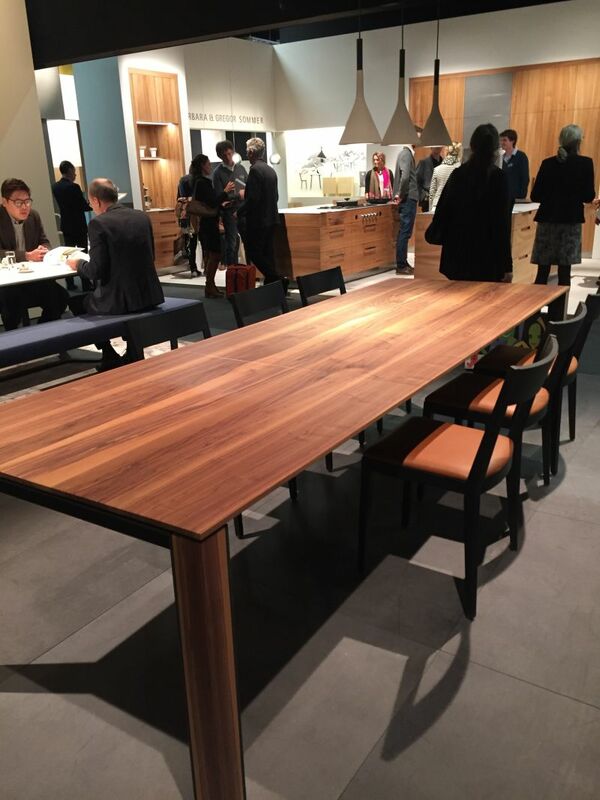 This would actually be a medium table although in certain contexts it would seem pretty small. 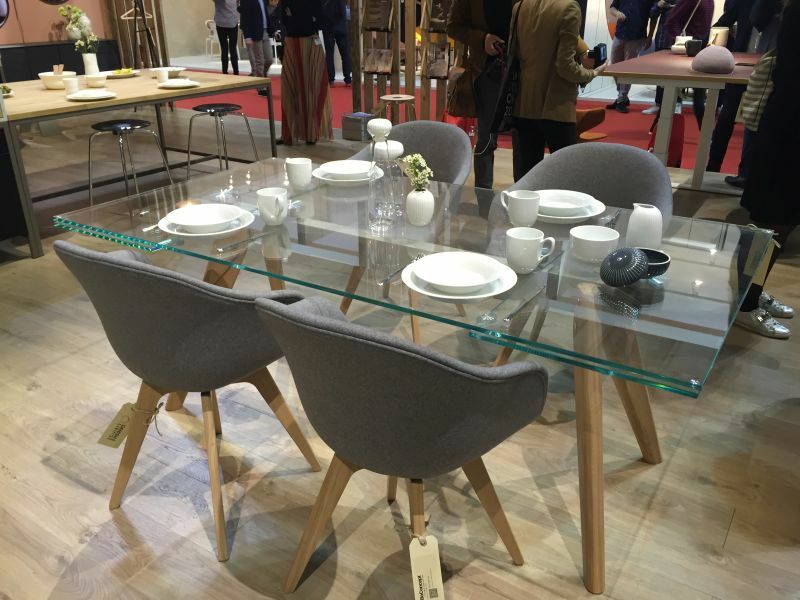 It has a simple and chic design which is also referenced in the design of the dining chairs. 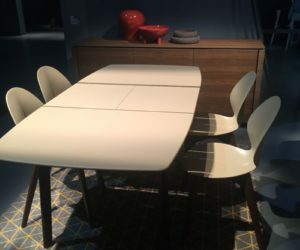 If you choose a small dining table to save space in the room, then you should also get chairs that match. Perhaps you’d enjoy using some comfy stools or some classical one-piece chairs. 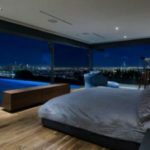 Modern is a relative term which has to do with a lot of different things. 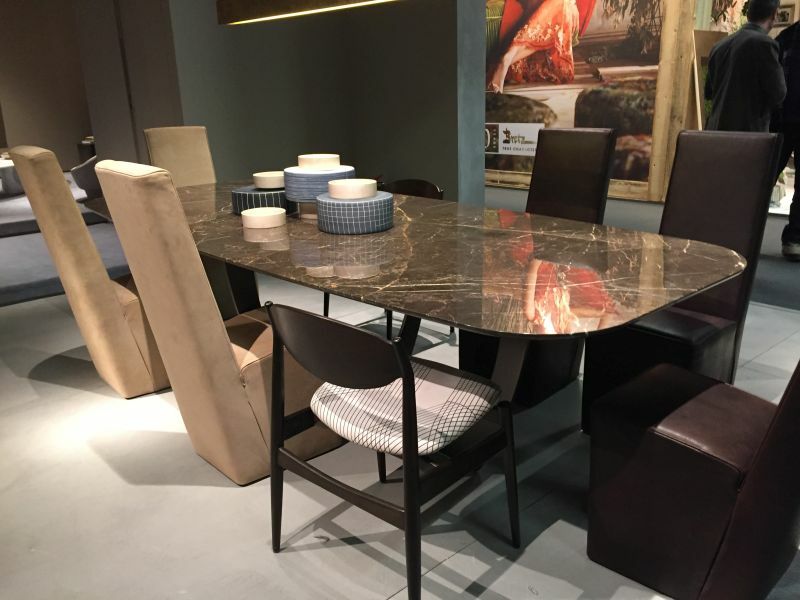 A modern dining table is usually characterized by simplicity and sophistication and these can be achieved in lots of eye-catching ways. 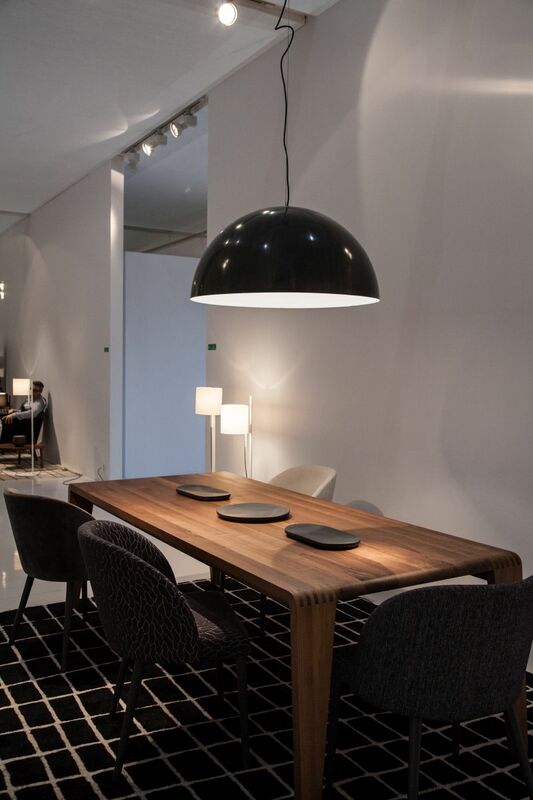 Apart from the conceptual simplicity of a modern dining table, there’s always something that makes it stand out. In this case is the black and shiny finish which let the top reflects the ceiling and everything on it. 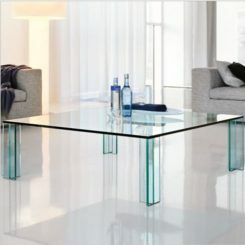 Another elegant example is this table which has a thick and solid top and a base made of glass. This makes it look lightweight and even makes it seem to hover. Sometimes a slight inconsistence in the design can be the detail that puts the design over the top. That’s why we find this table so interesting. It’s a regular table just like all the others except for that one curved edge. 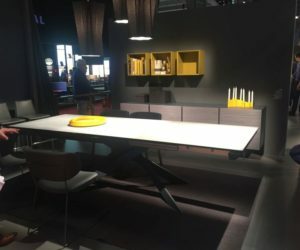 This has a table that looks pretty high-tech and this makes it suitable for a specific type of decors. 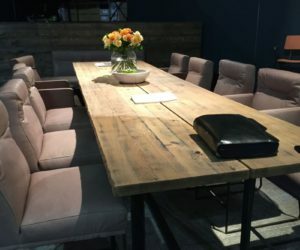 Also, the look also allows the table to fit nicely in a home office or a meeting room. 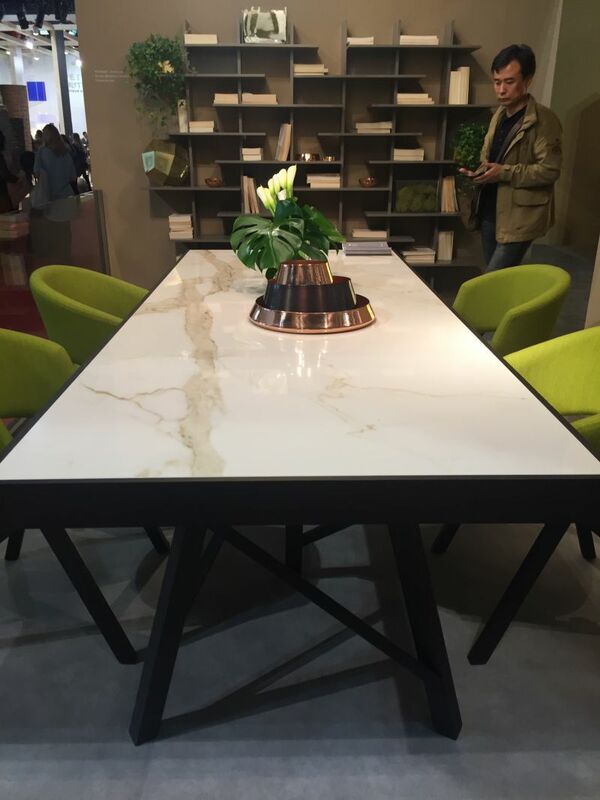 The fact that this table has a pedestal base instead of the usual four legs gives it a distinctively elegant and stylish look. 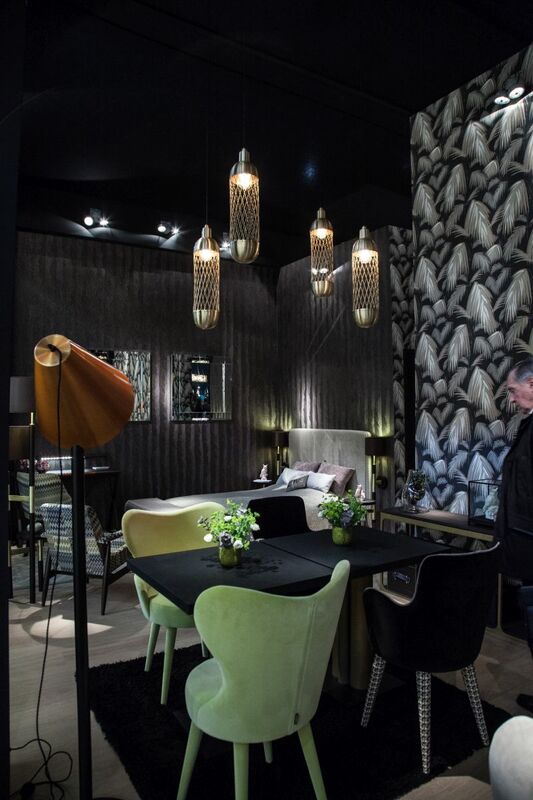 Further more, the combination of materials is a modern and versatile one. 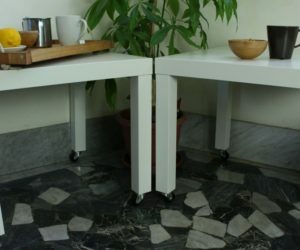 A lot of modern tables actually distance themselves from the classical four leg structure. This one, for example, is supported by two sleek structures made of stainless steel. 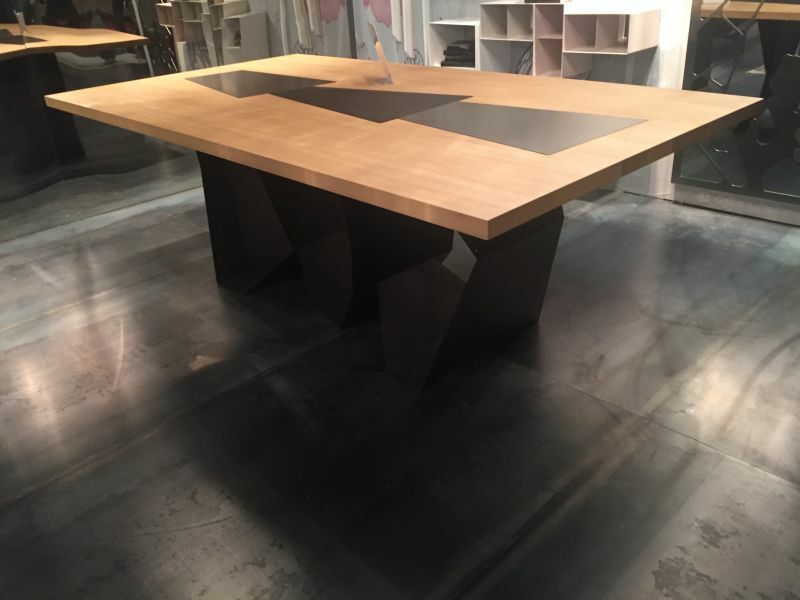 A similar design is also featured by this table but in this case the look is different due to the choice of materials and finishes. 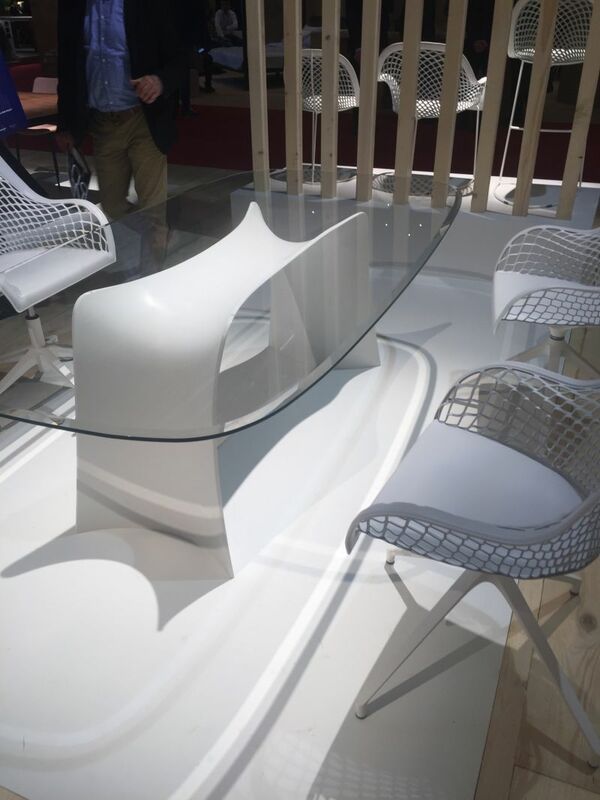 This is a table that’s meant to look robust and solid. 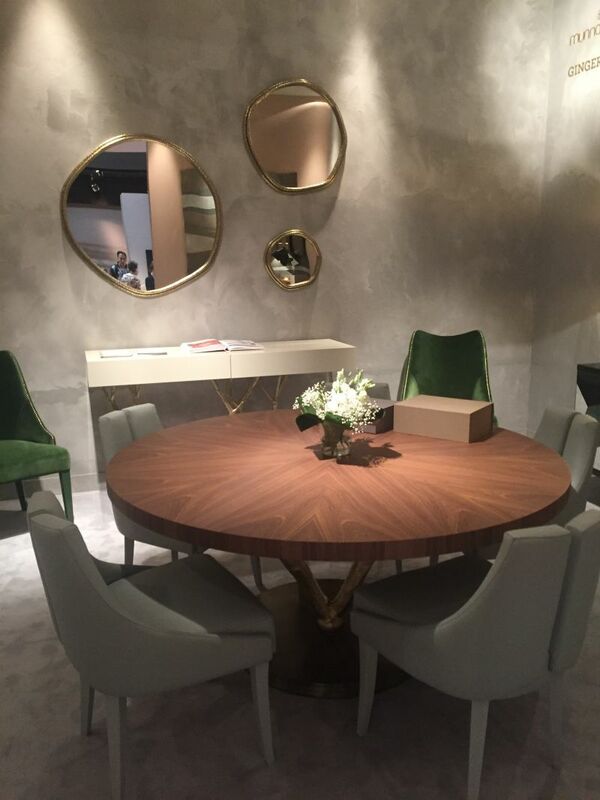 We now return to pedestal table to admire once more their elegance. 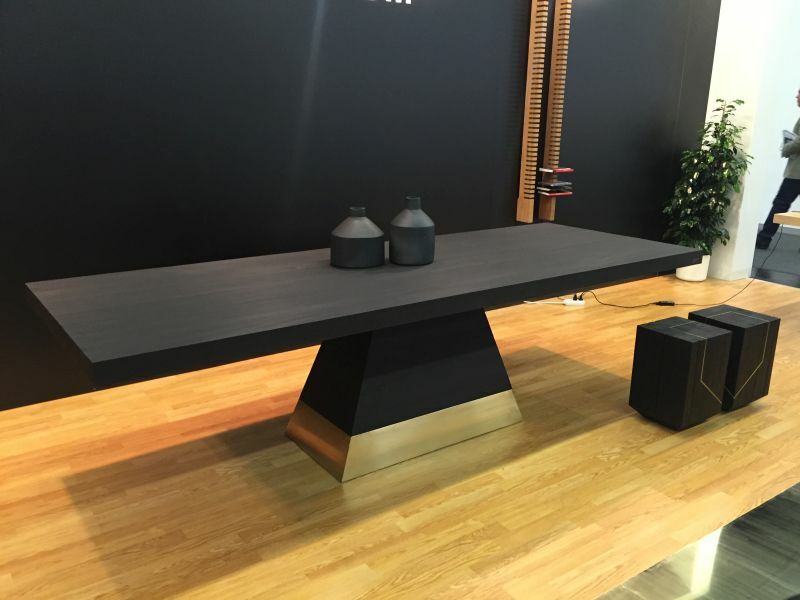 We enjoy the symmetry of this table and also the combination of matte black and shiny gold. 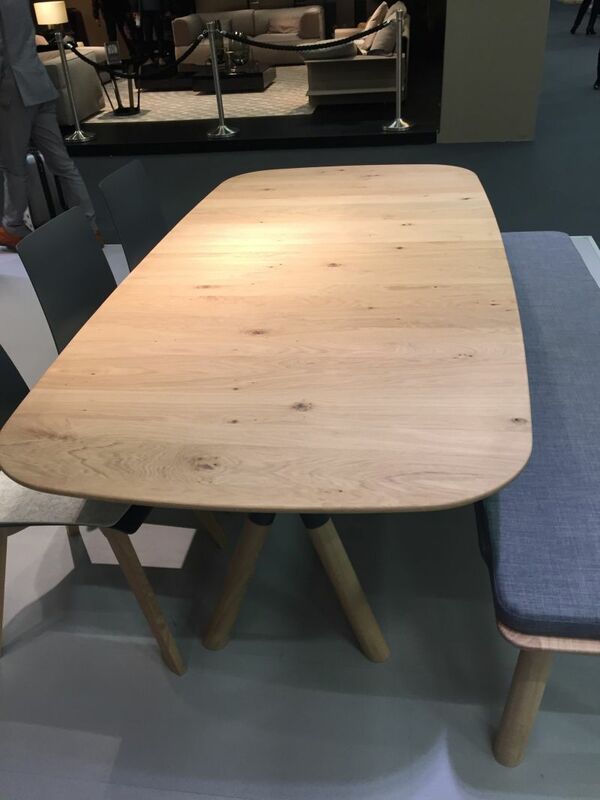 Everything about this table is simple and yet it looks really eye-catching thanks to its subtle charm and the uniqueness of the live-edge top. 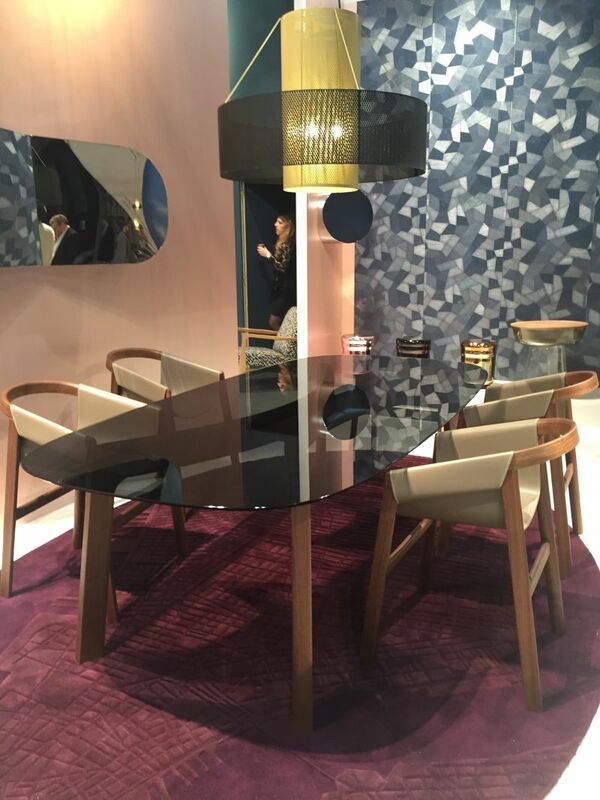 A lot of modern dining tables are designed with sculptural bases. Their intricacy is complemented by a very simple top and this way a nice balance is established. This table is intriguing in a whole different way. 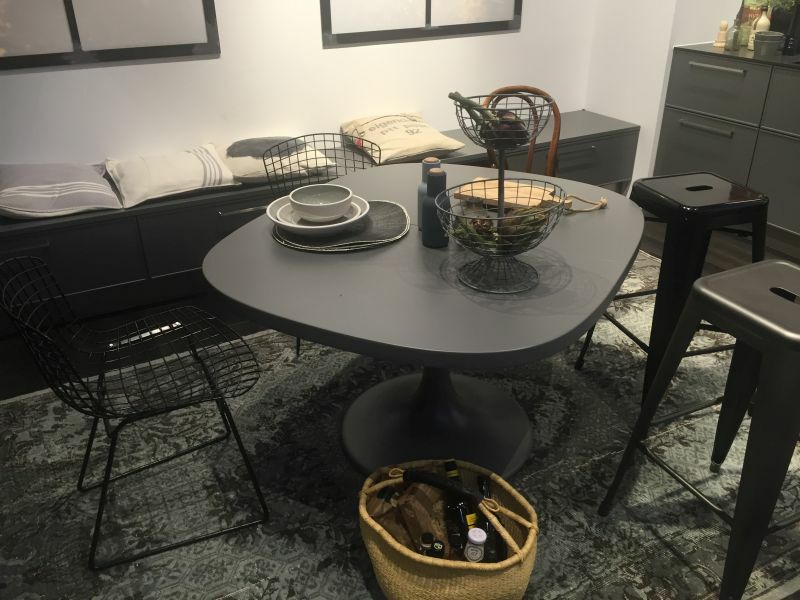 Instead of getting rid of the usual four legs and opting for something simpler, this table actually has lots of thin legs all gathered in a rectangular shape at the center. 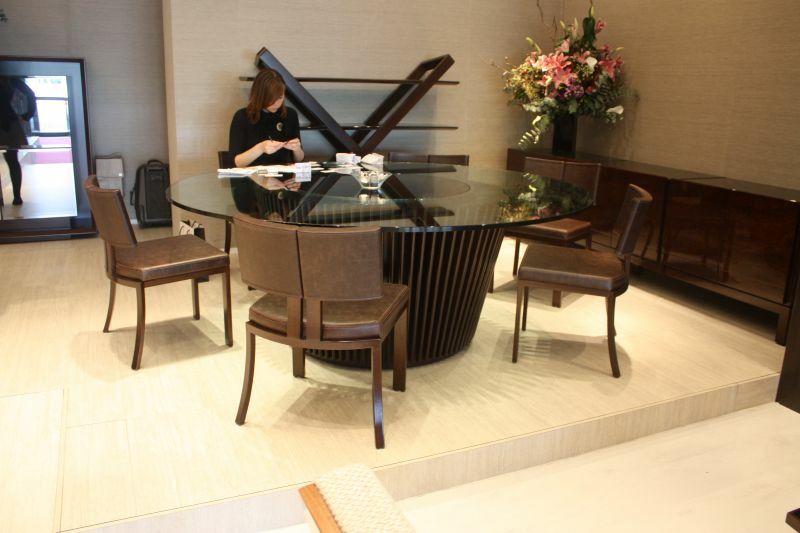 There are also some really interesting variations of the classical dining table. 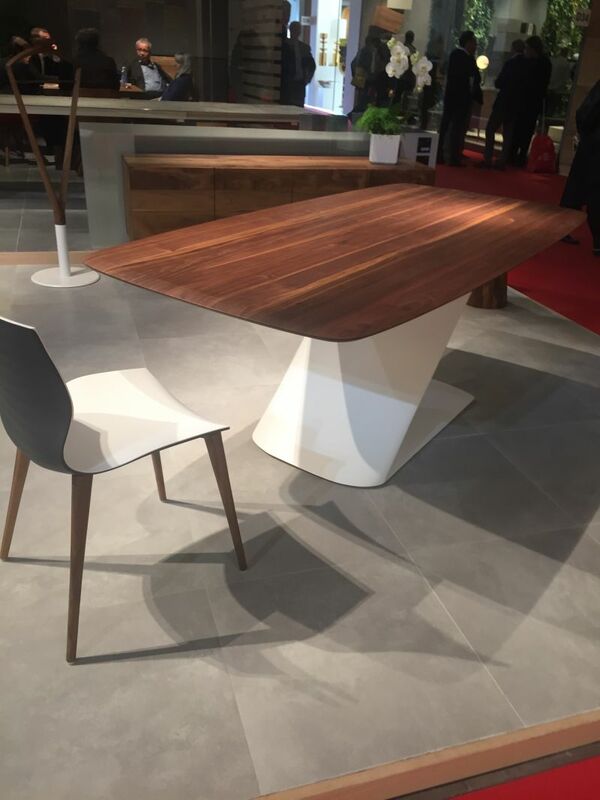 This design for example has a simple wooden top supported by four robust and sculptural legs. 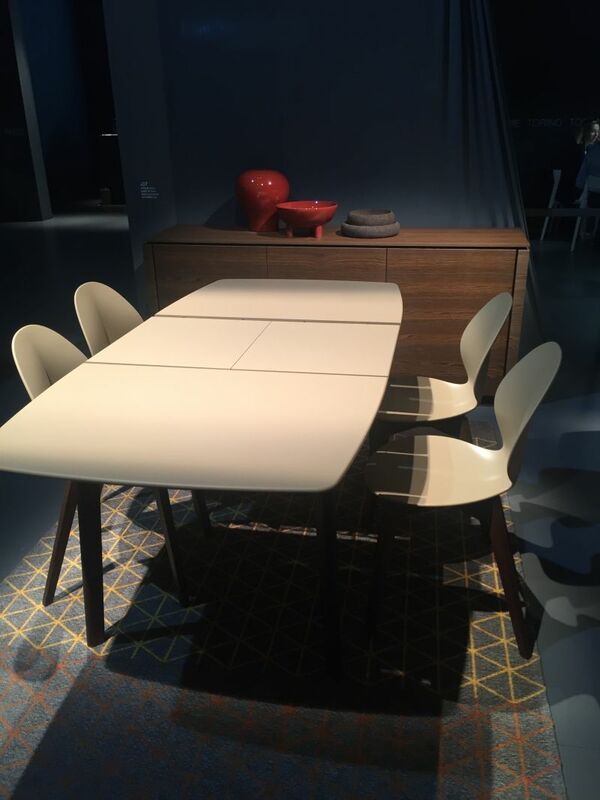 When searching for a modern dining table, you could also look for something unexpected like an unusual combination of materials, a bold color or an interesting pattern. 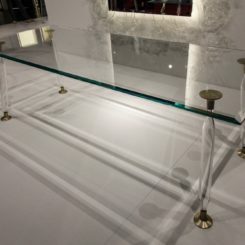 Glass is a tricky material when it comes to tables and furniture in general. You can either love it or hate it. 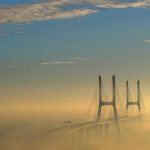 In any case, there are a few advantages that anyone has to recognize. 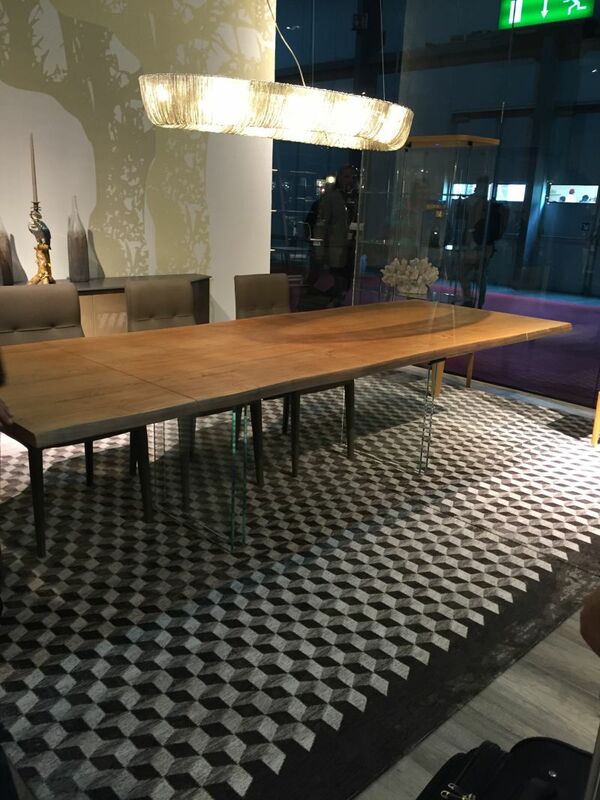 For example, a glass top dining table never overwhelms the room regardless of how big it is. That means you can make the most of a small dining room with a glass table. 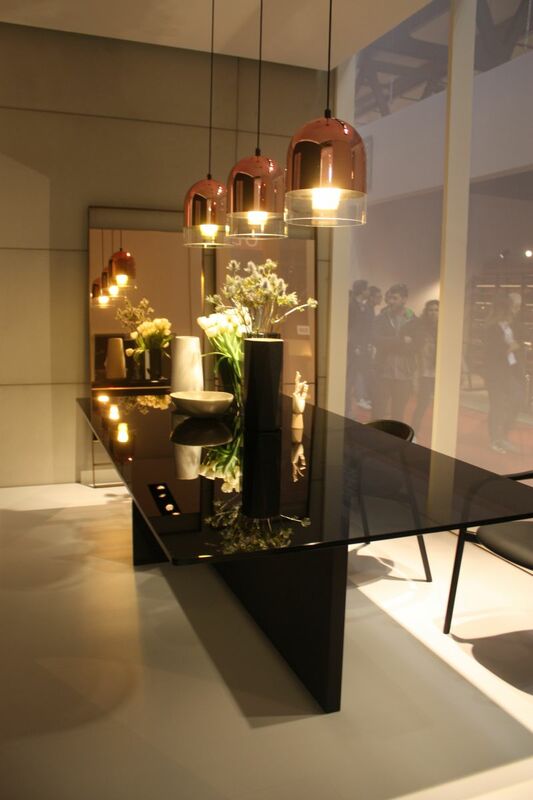 Also, a table with a transparent glass top emphasizes the base more than other models. 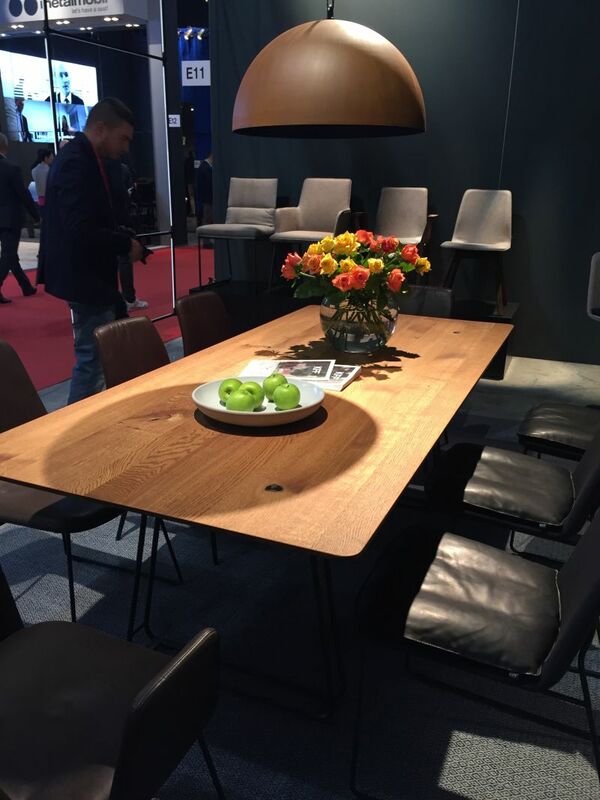 That means that you could look for a table with a really interesting design, something like this. 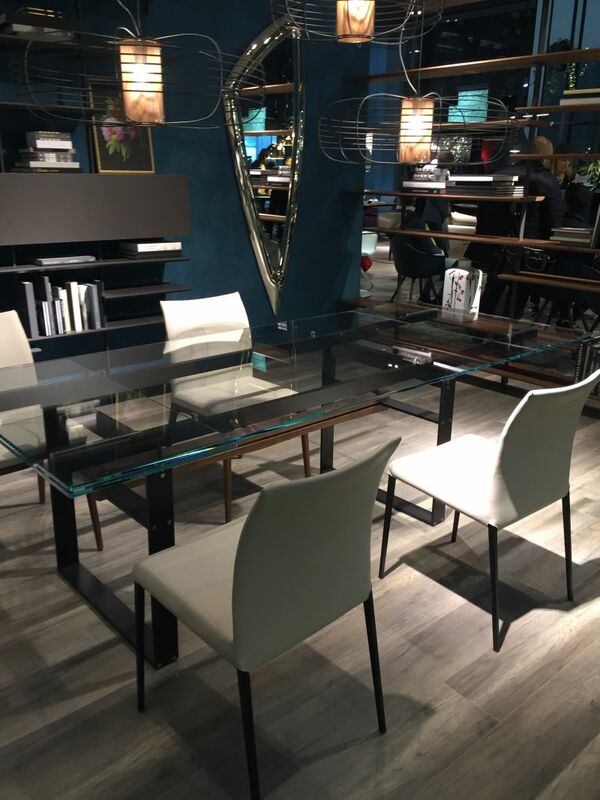 A dining table with a glass top maintains a spacious and airy ambiance in the room. 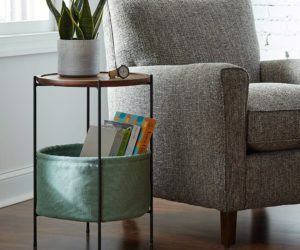 This makes such a table a good option for a small room. 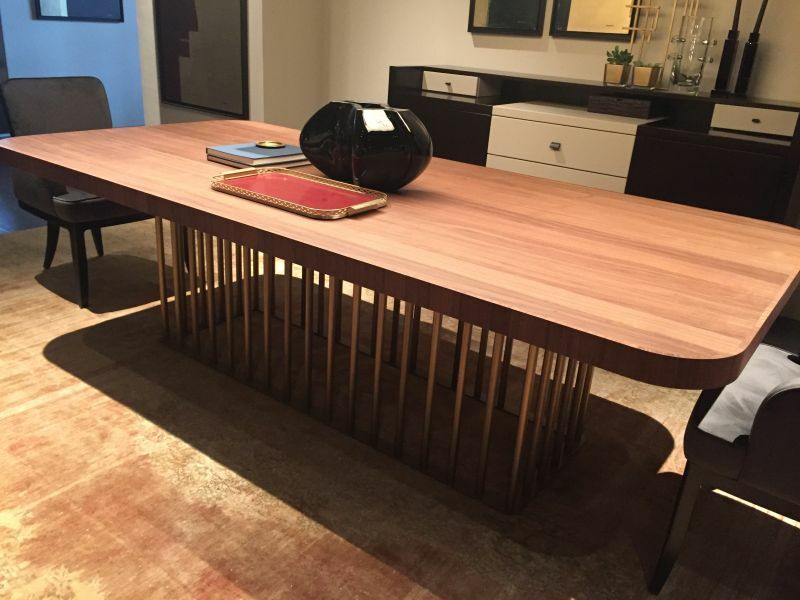 Of course, you can also make this table the focal point of a spacious or open dining area. 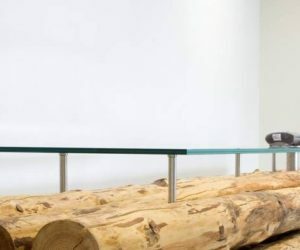 Not all glass tables are modern and minimalist. 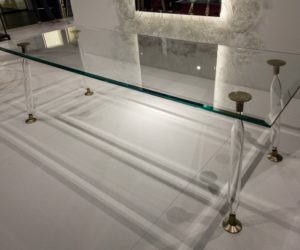 In fact, glass furniture is quite traditional at its core. This is a detailed design that celebrates the delicacy and fragility of glass.